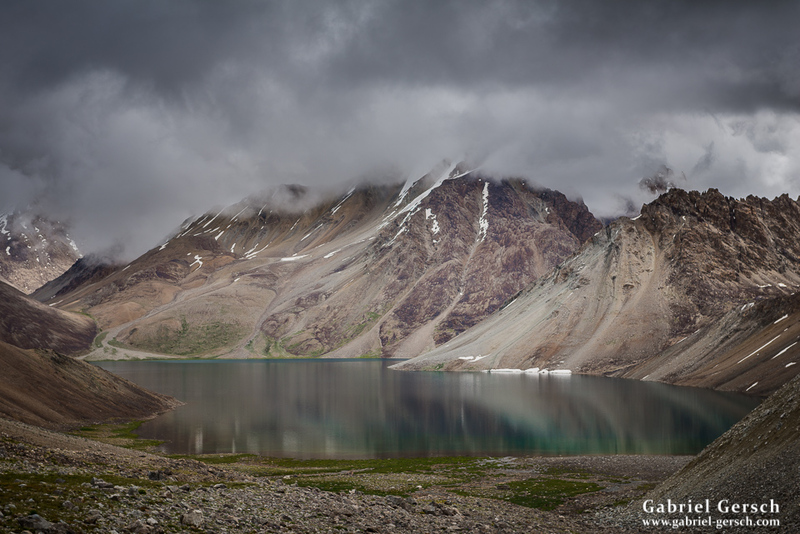 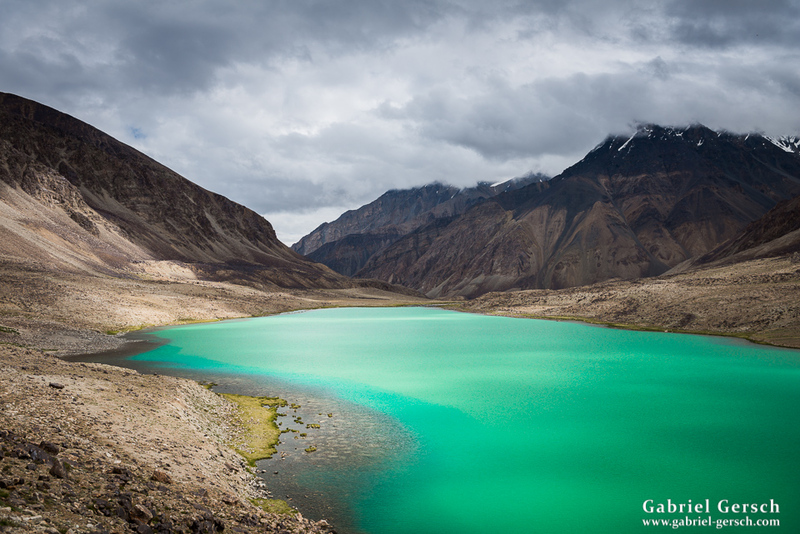 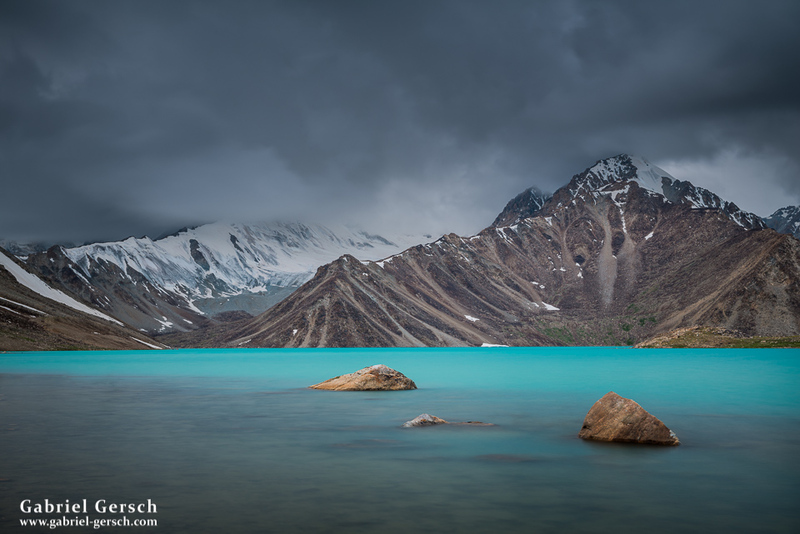 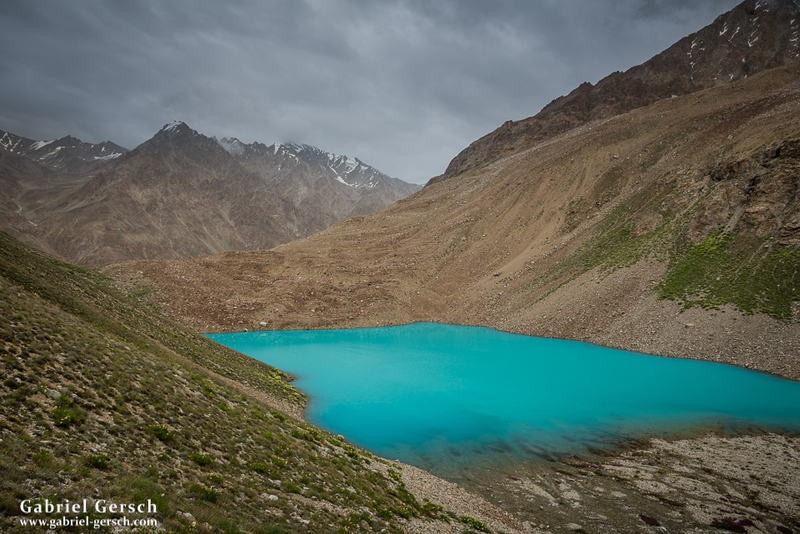 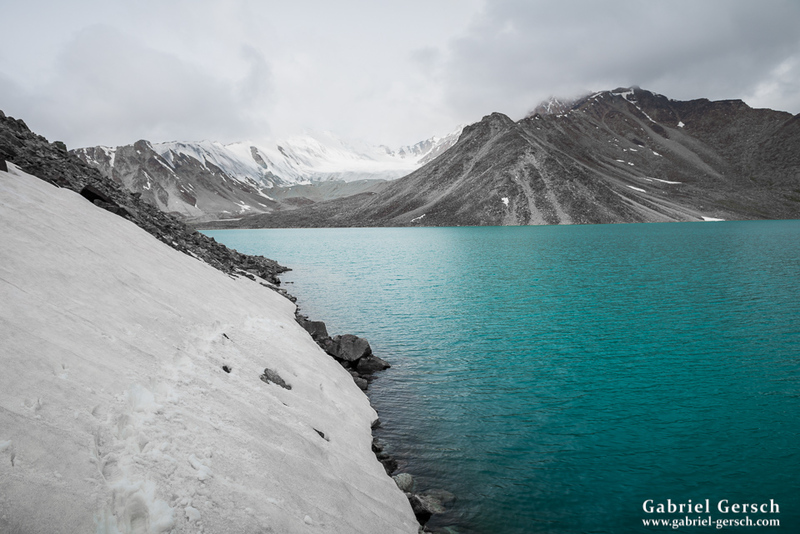 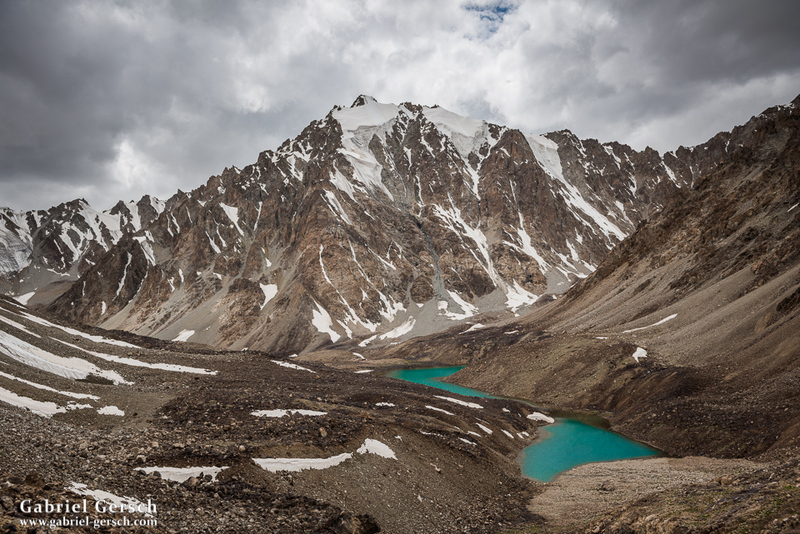 After arriving in the village of Bachor, Sofia and I went on a 15-day hike through Tajik National Park which led us past countless lakes and into an altitude of over 5.000 meters. 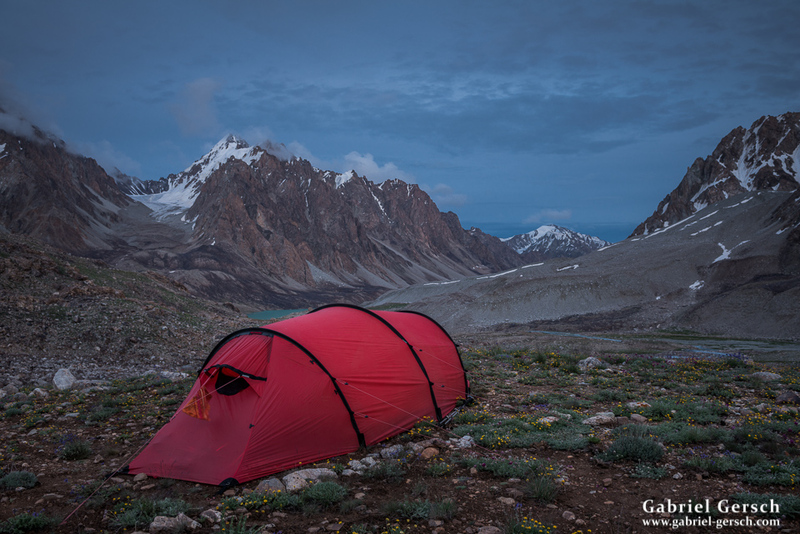 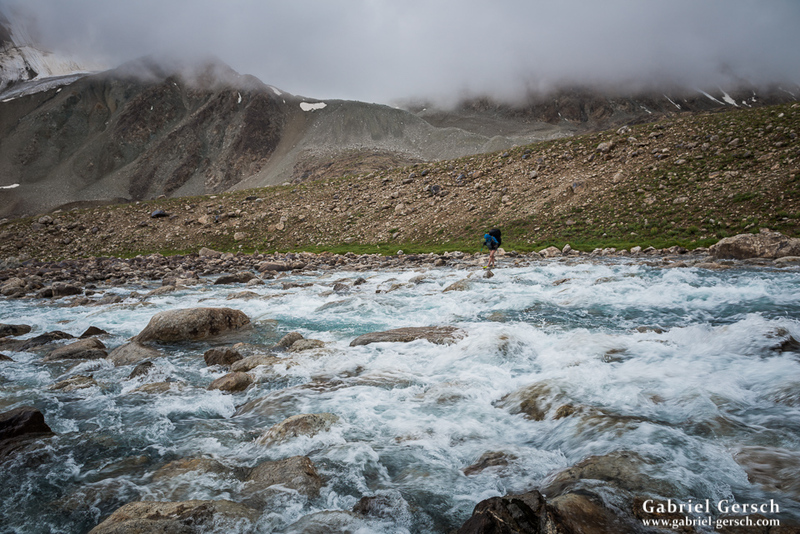 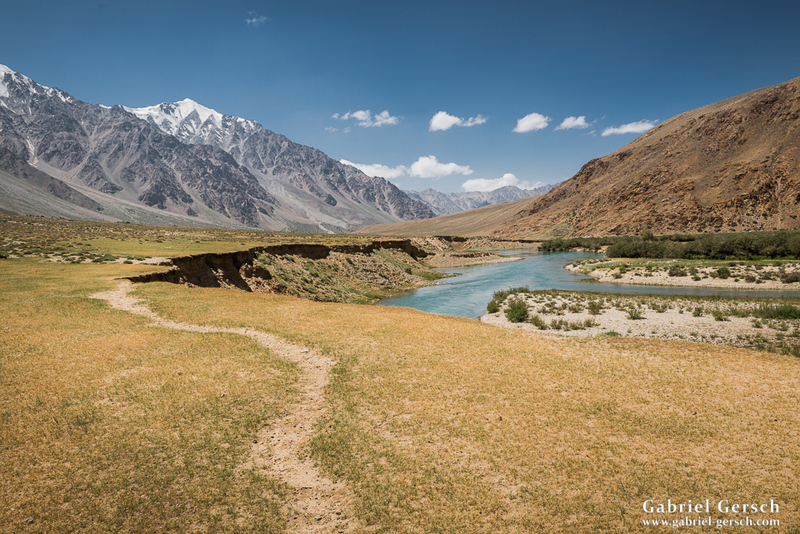 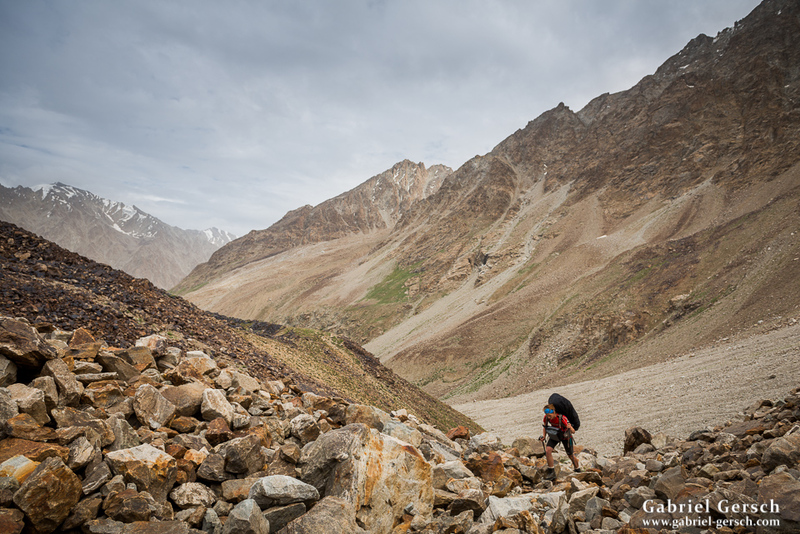 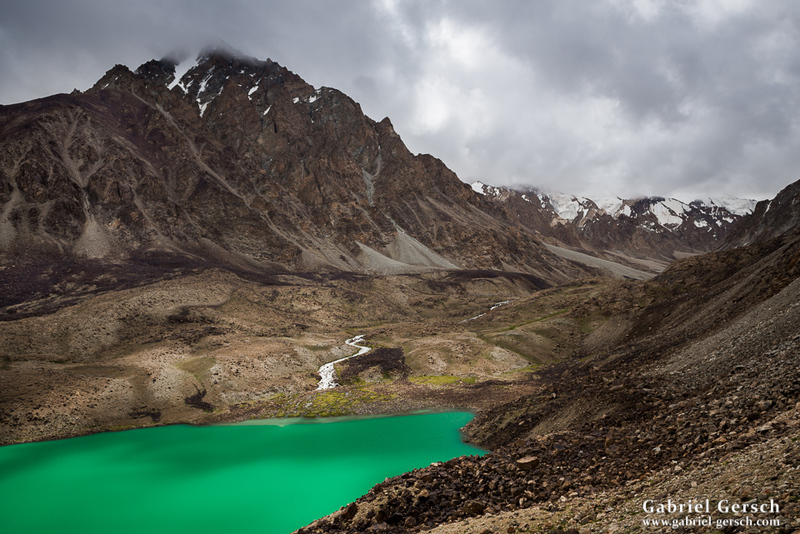 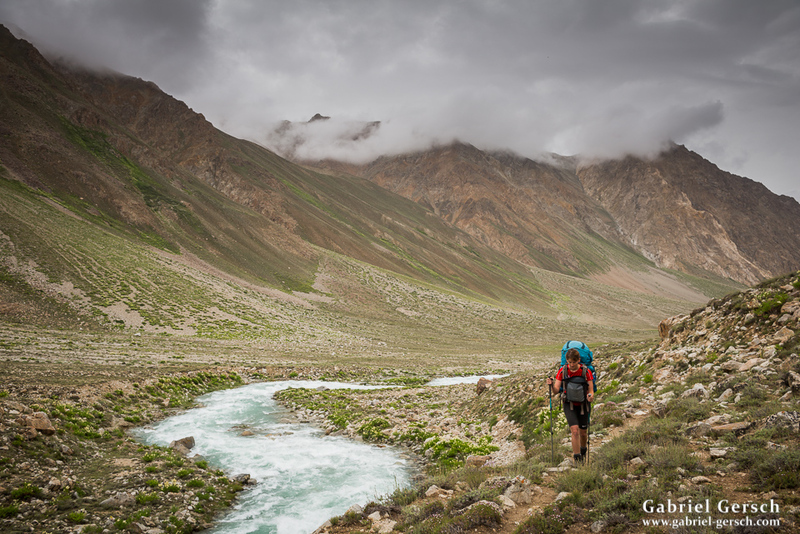 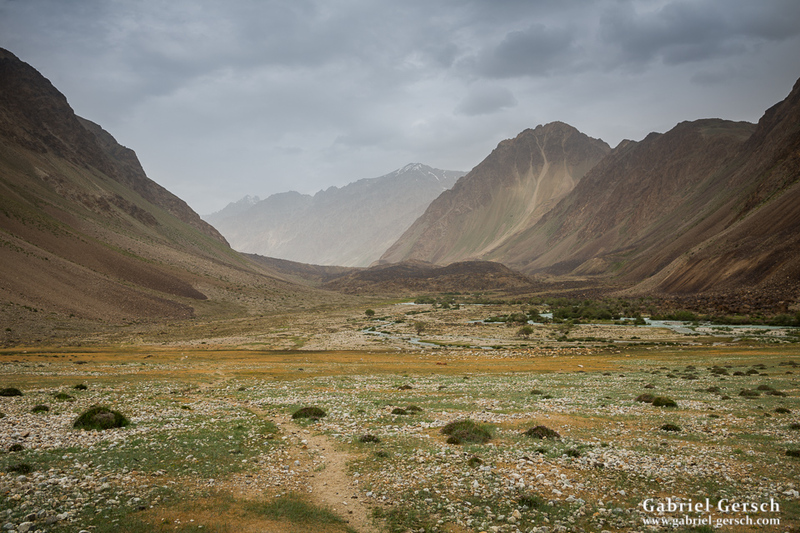 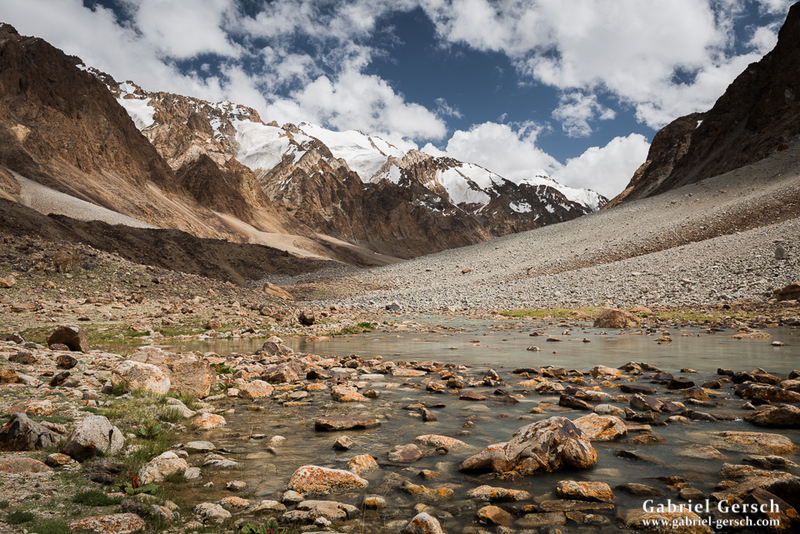 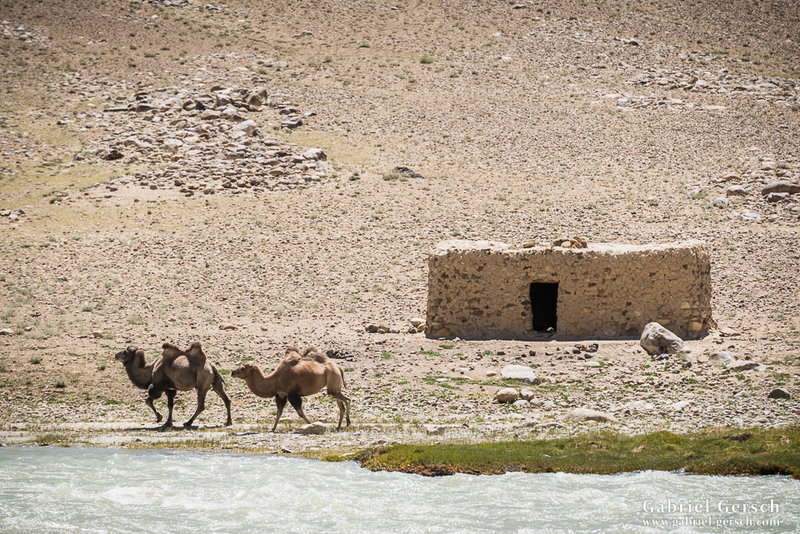 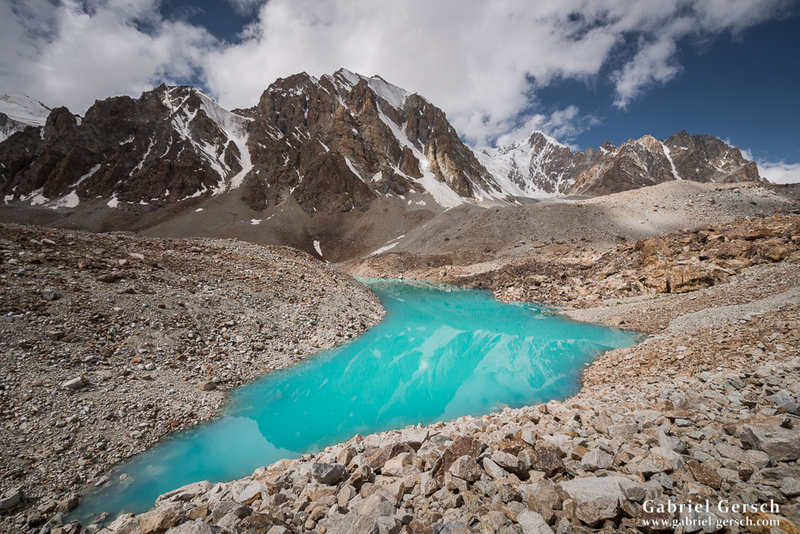 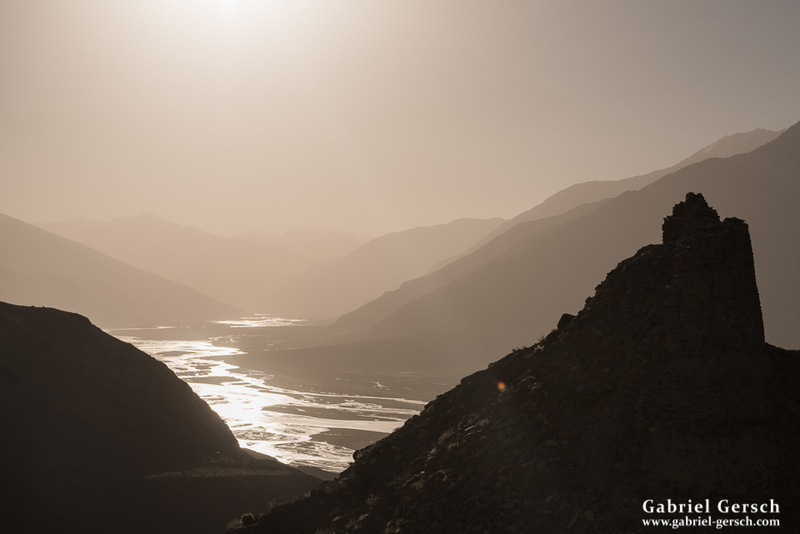 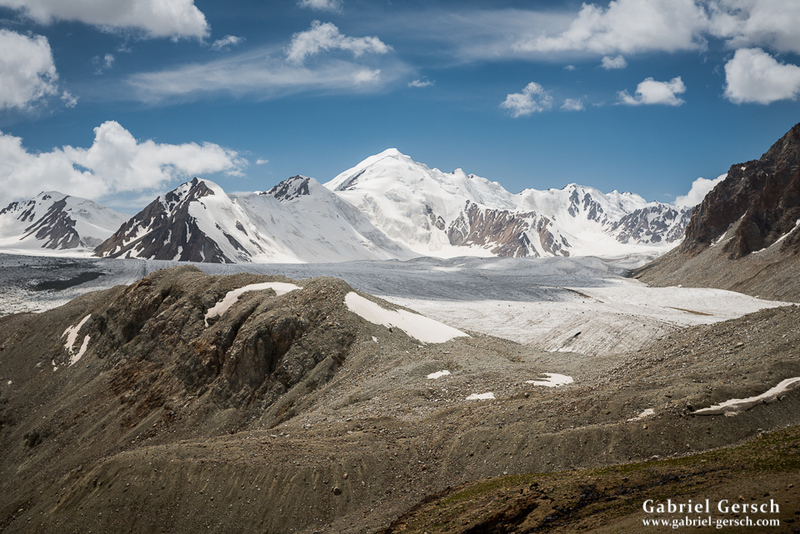 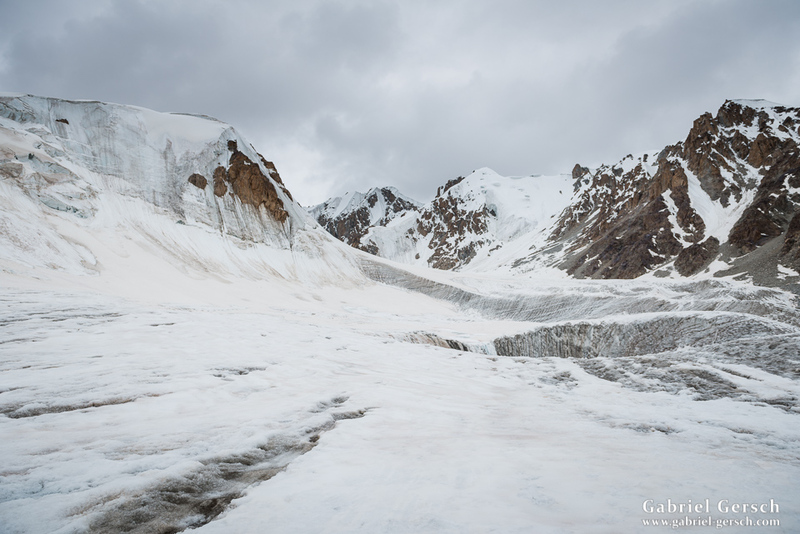 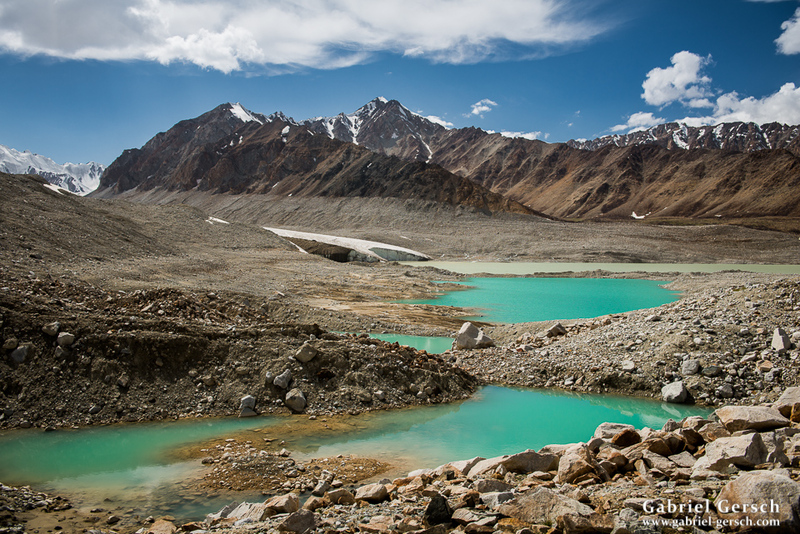 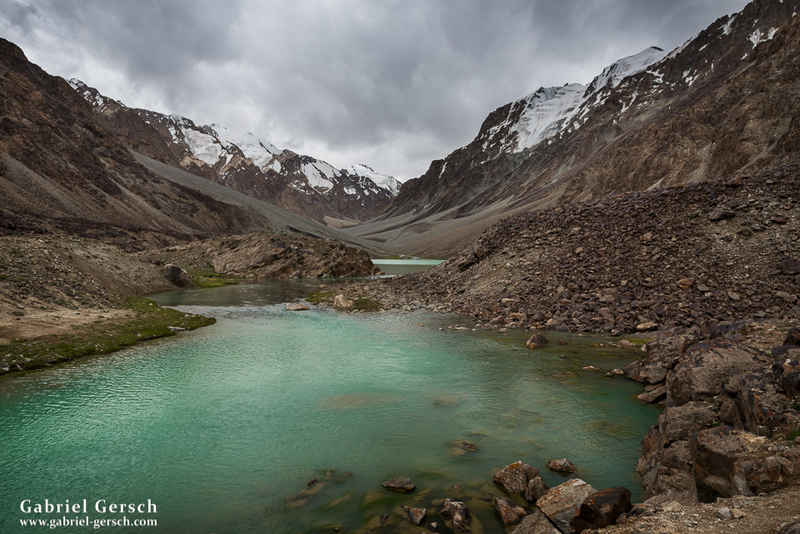 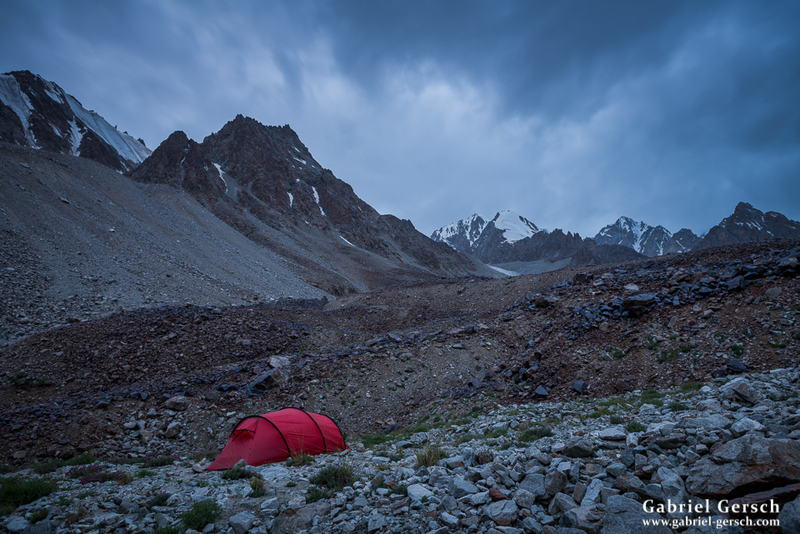 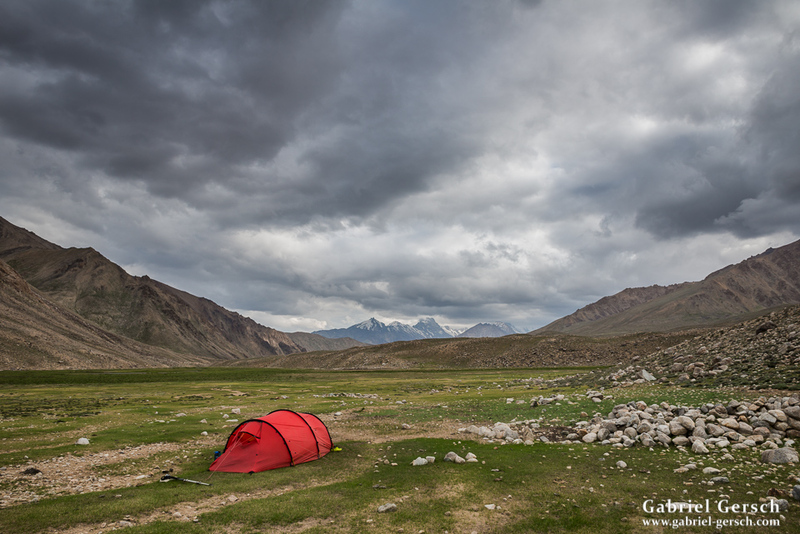 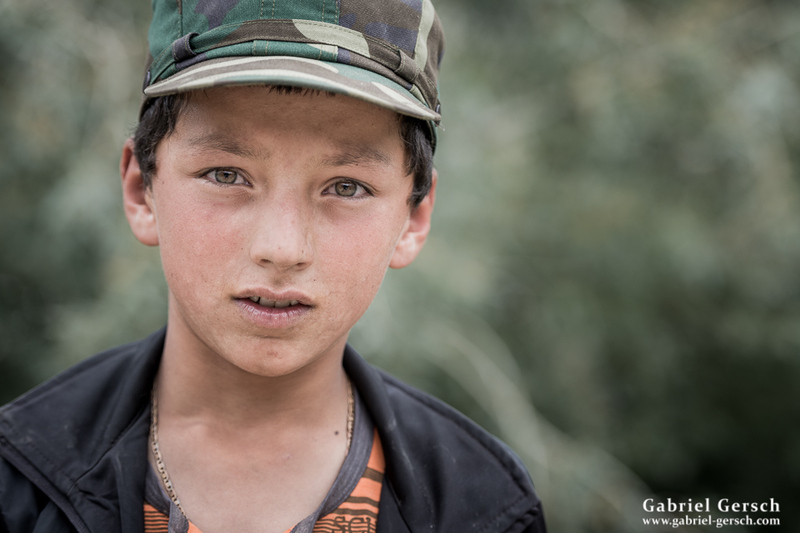 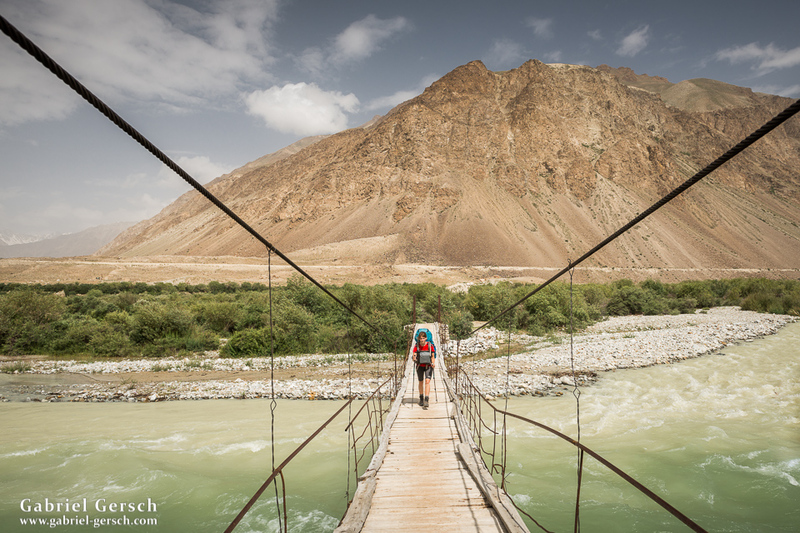 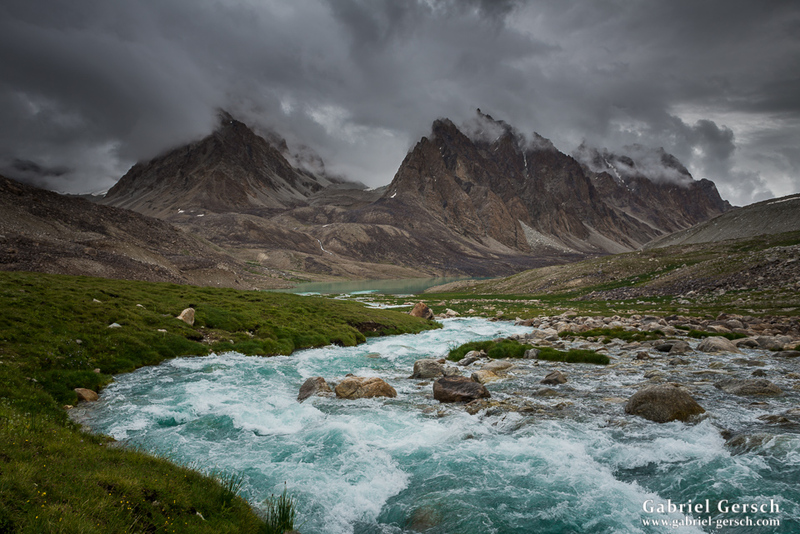 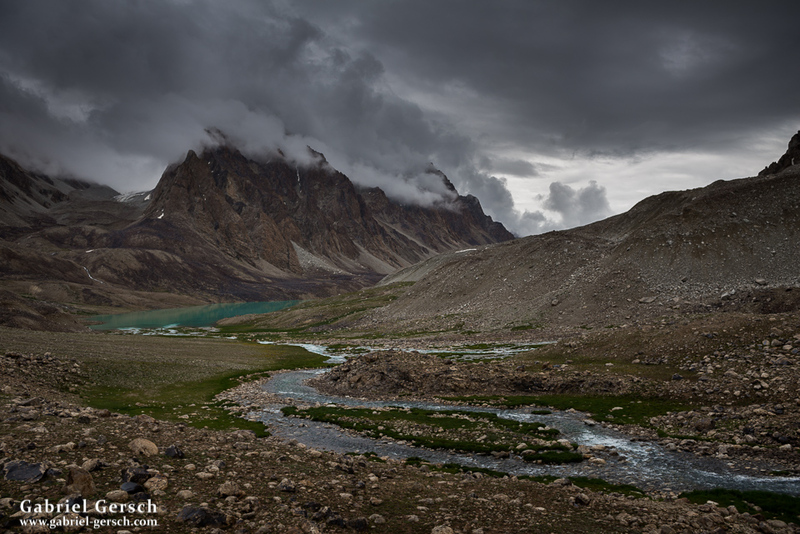 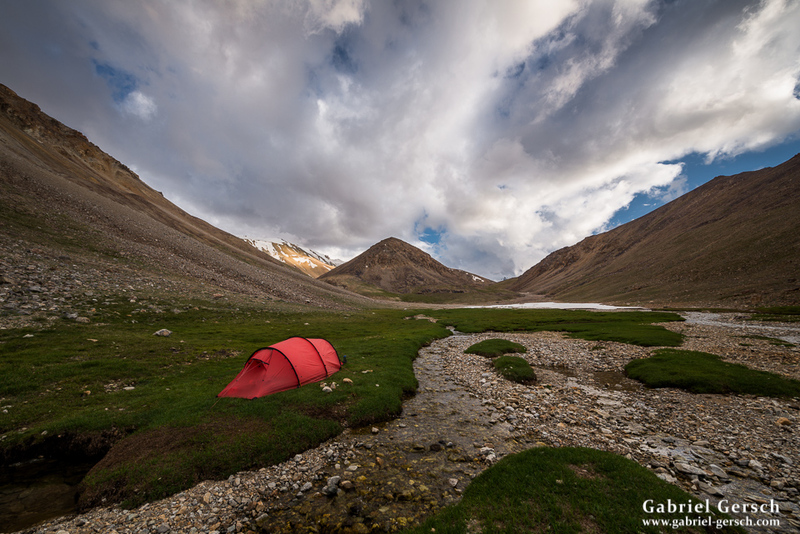 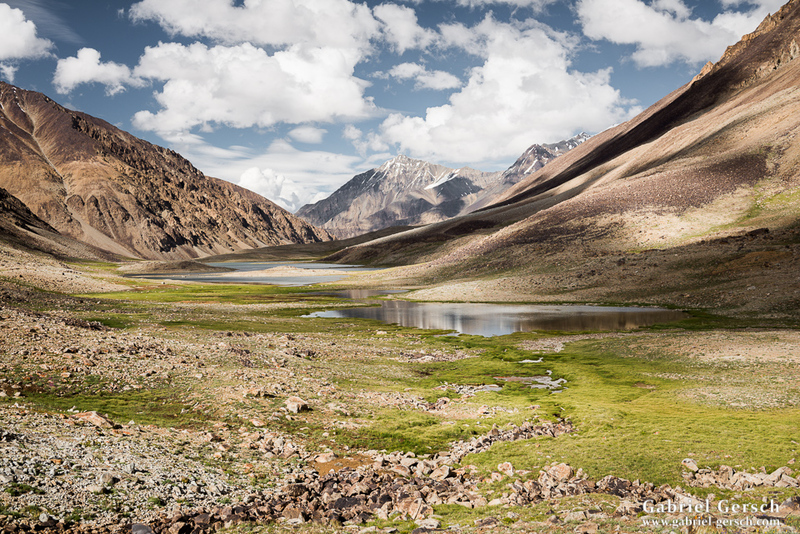 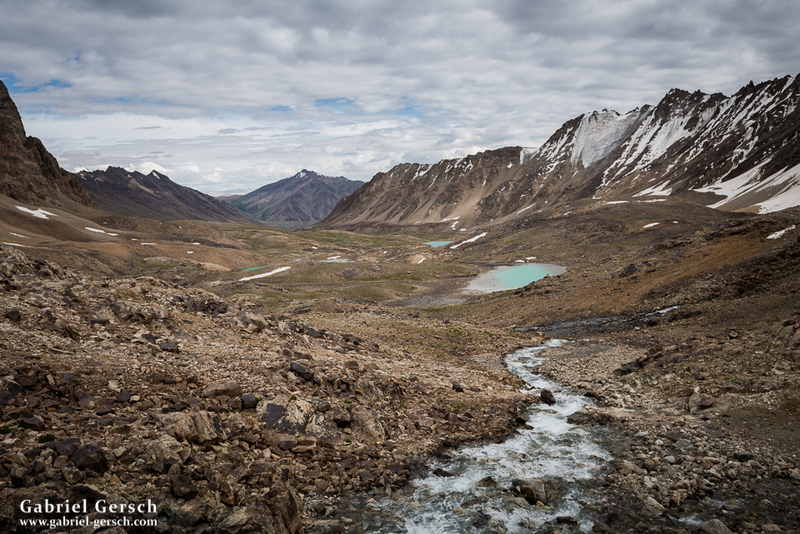 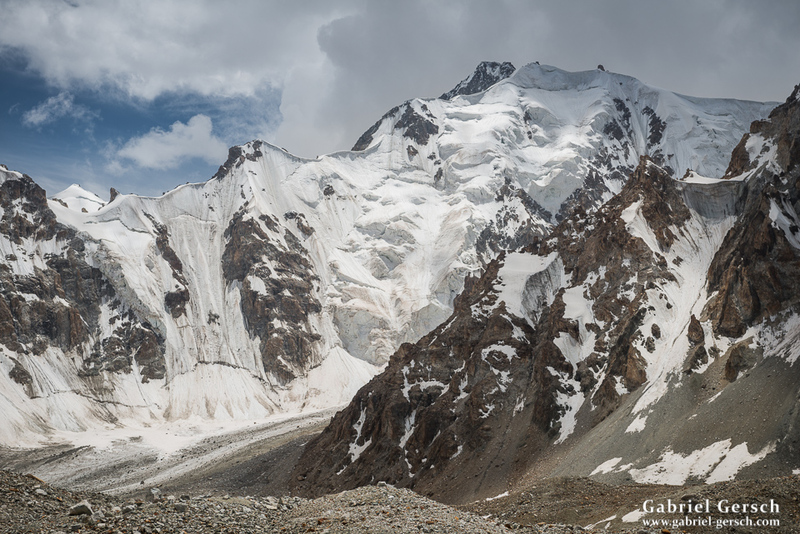 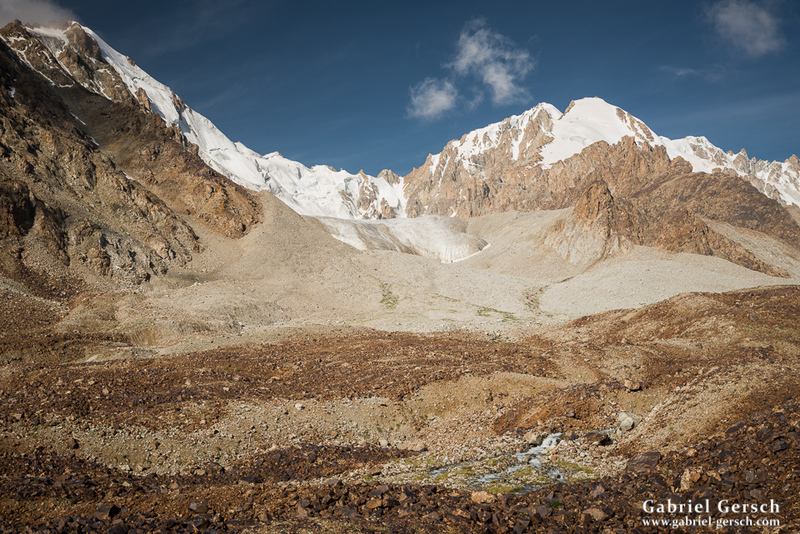 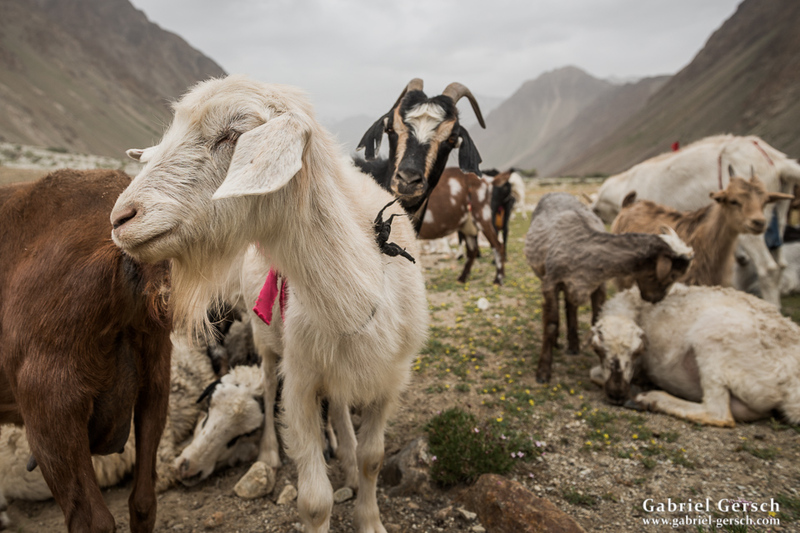 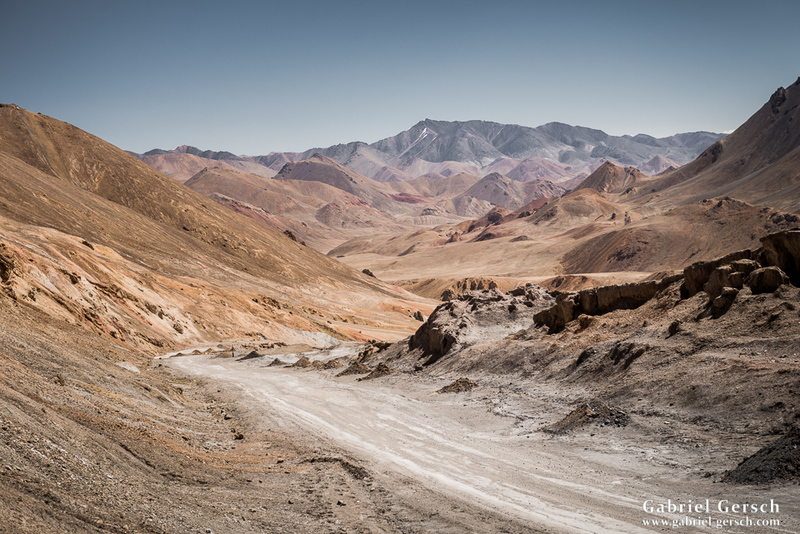 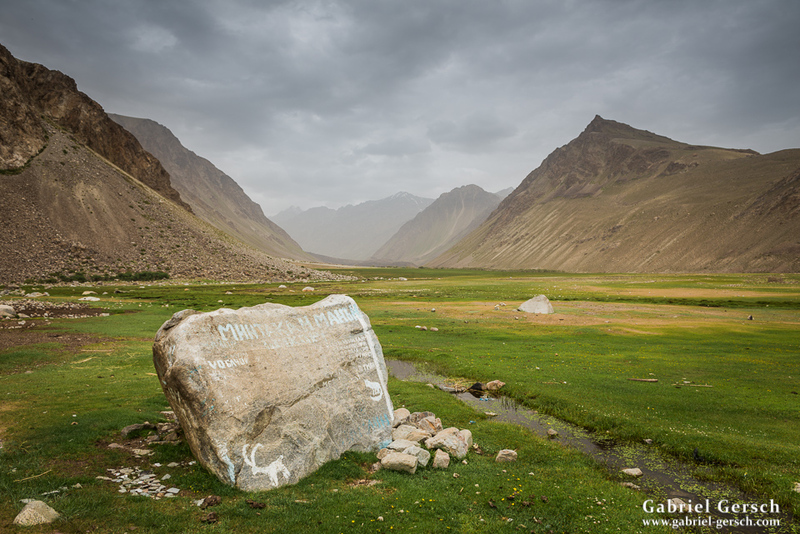 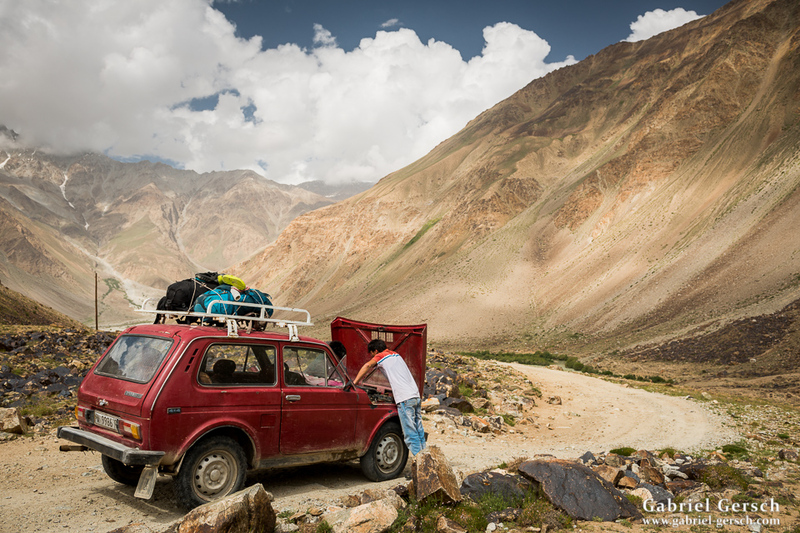 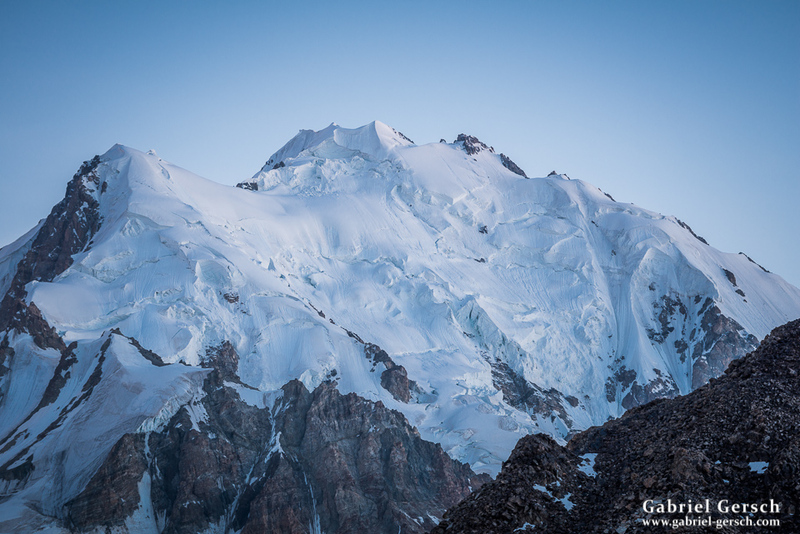 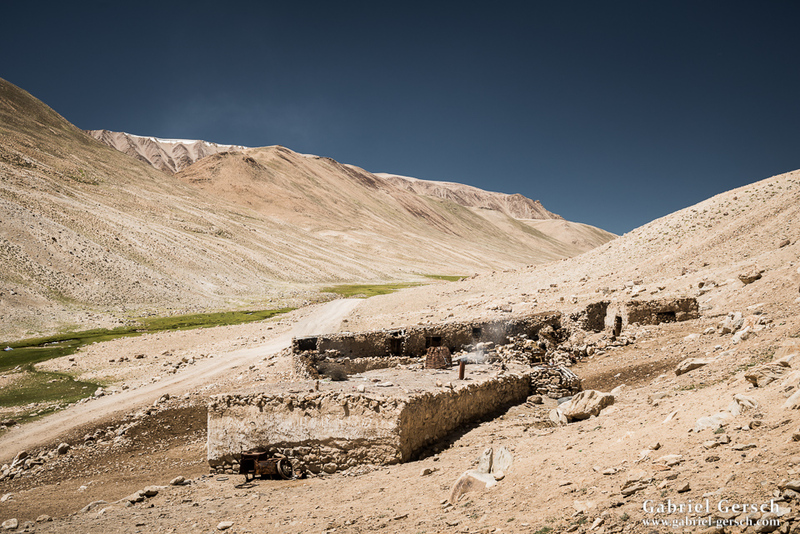 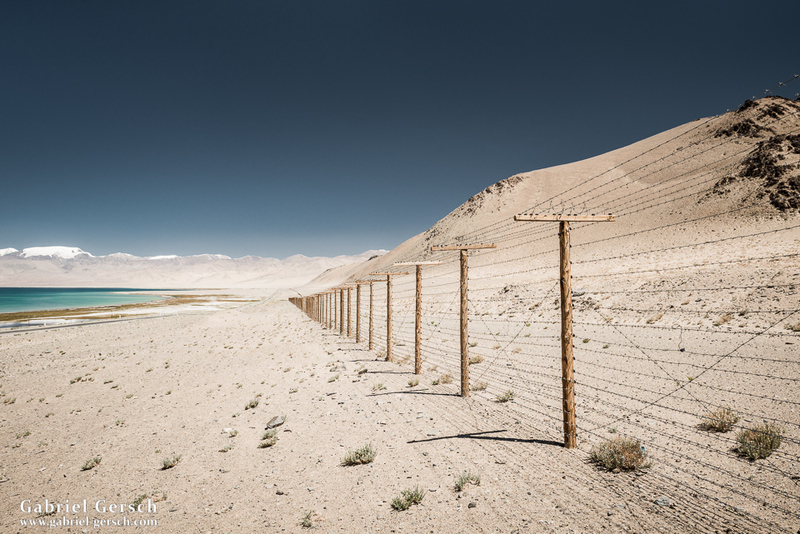 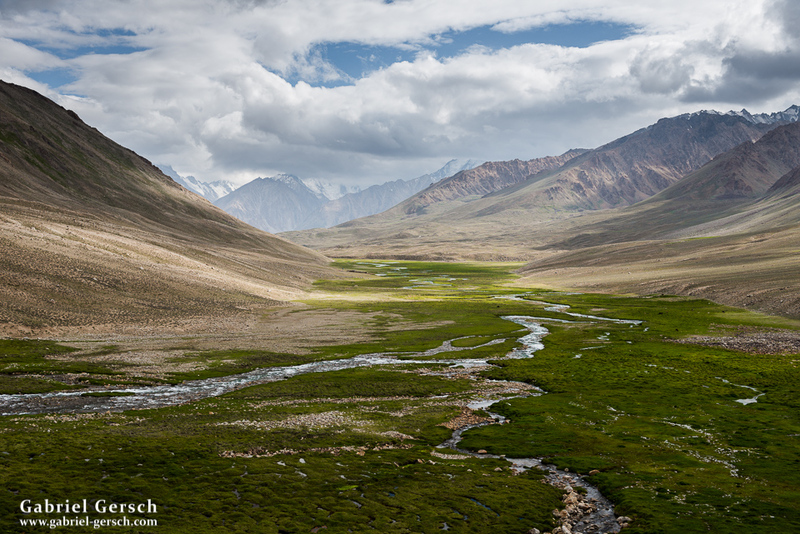 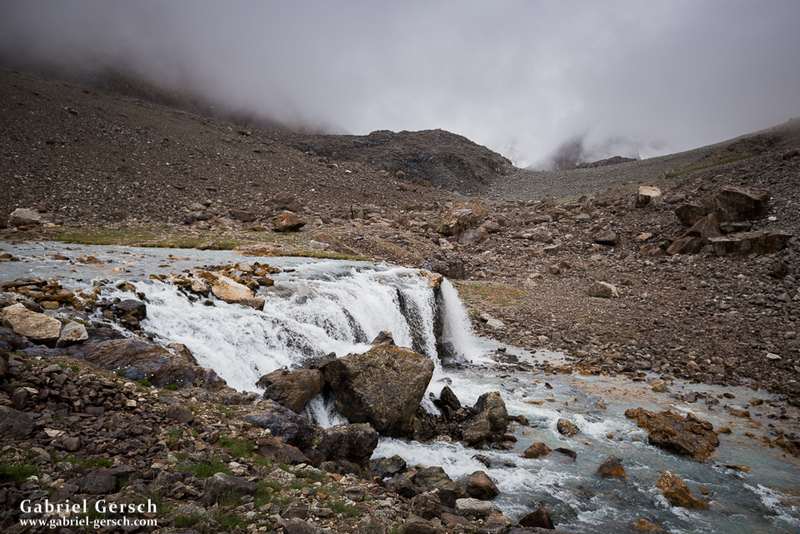 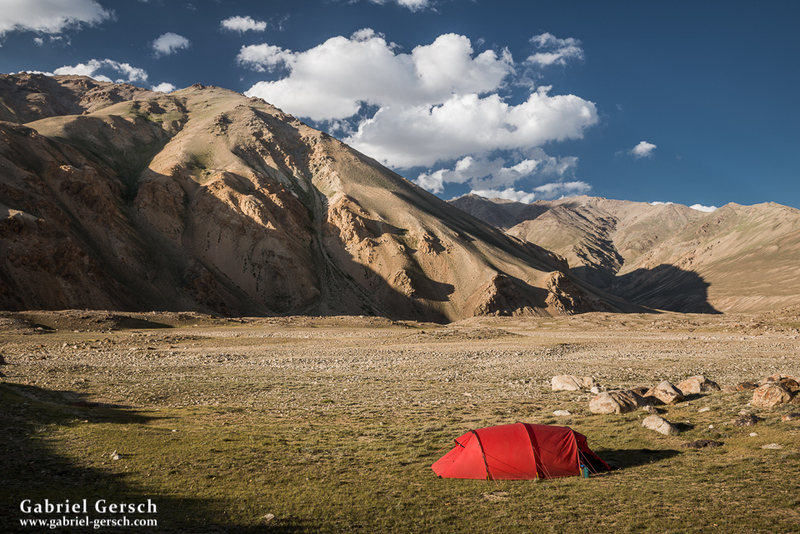 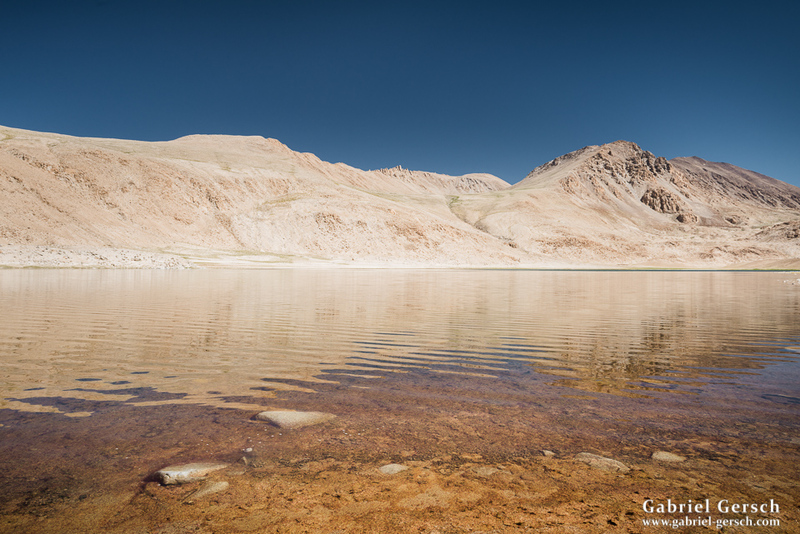 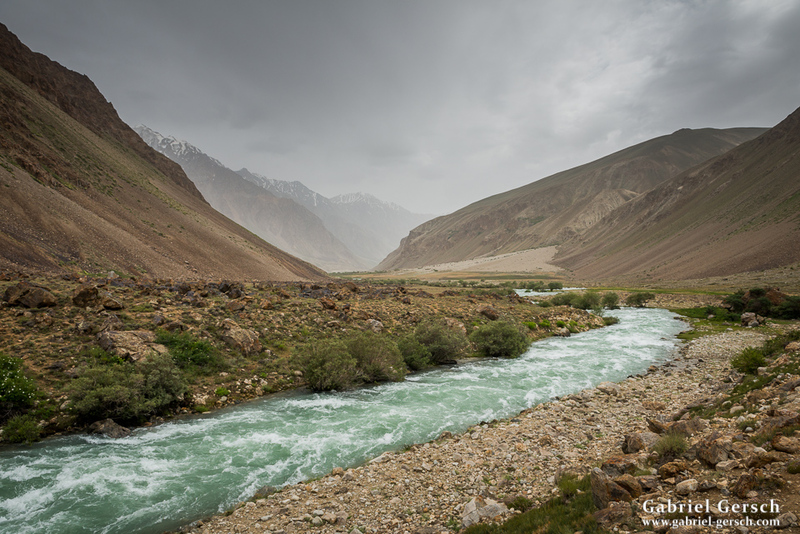 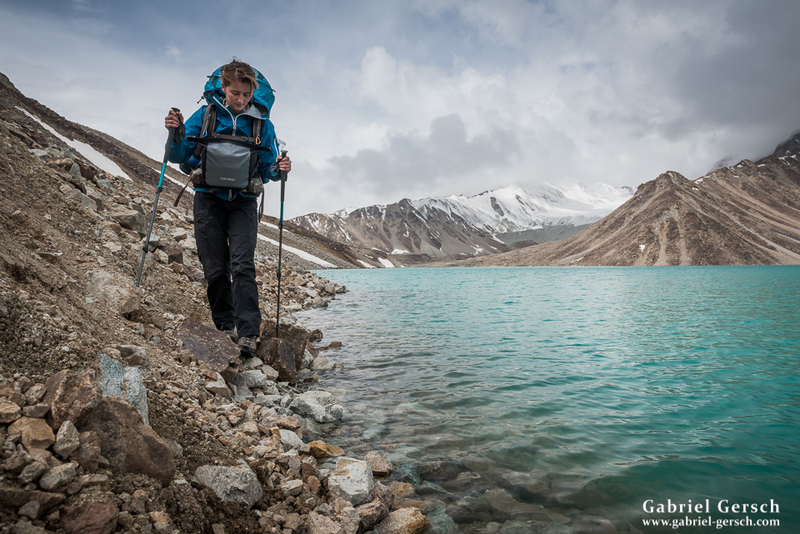 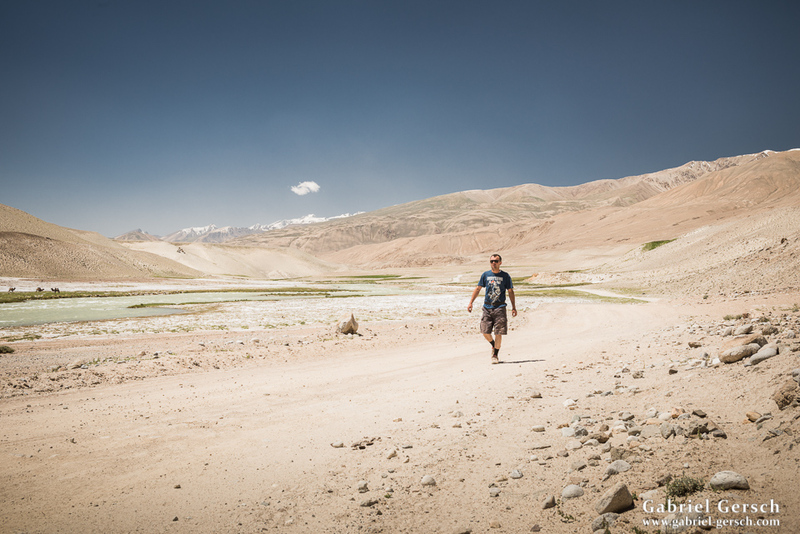 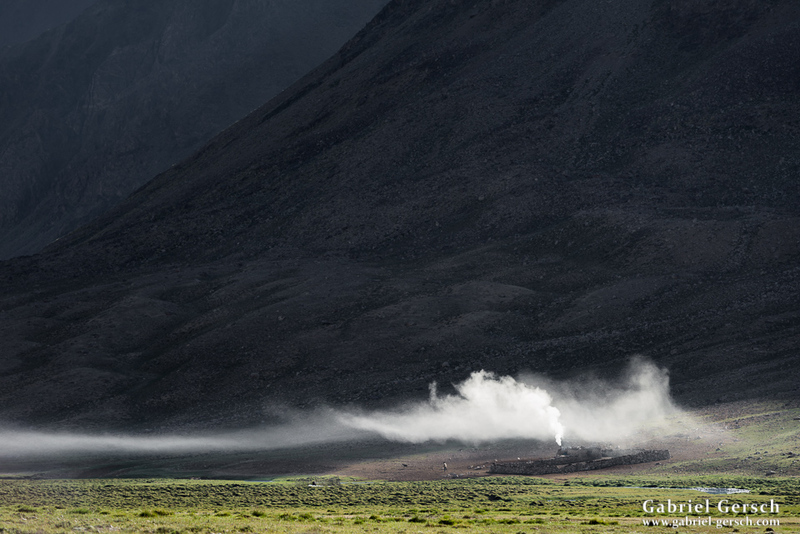 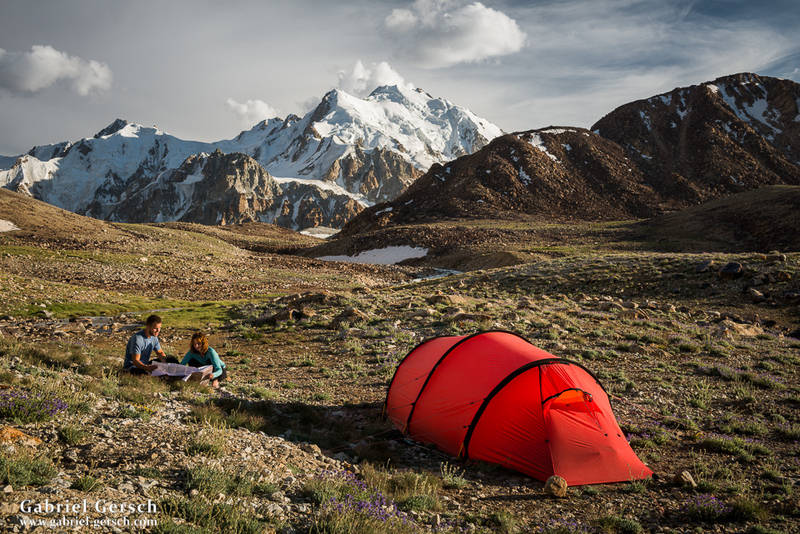 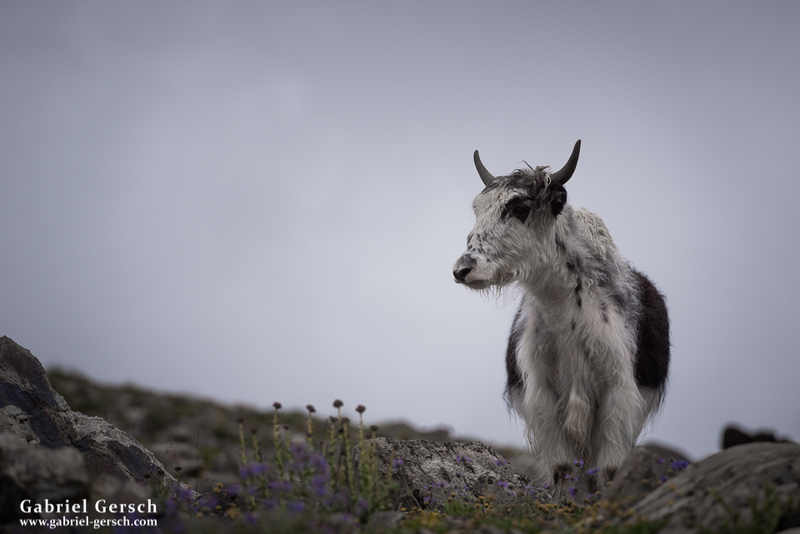 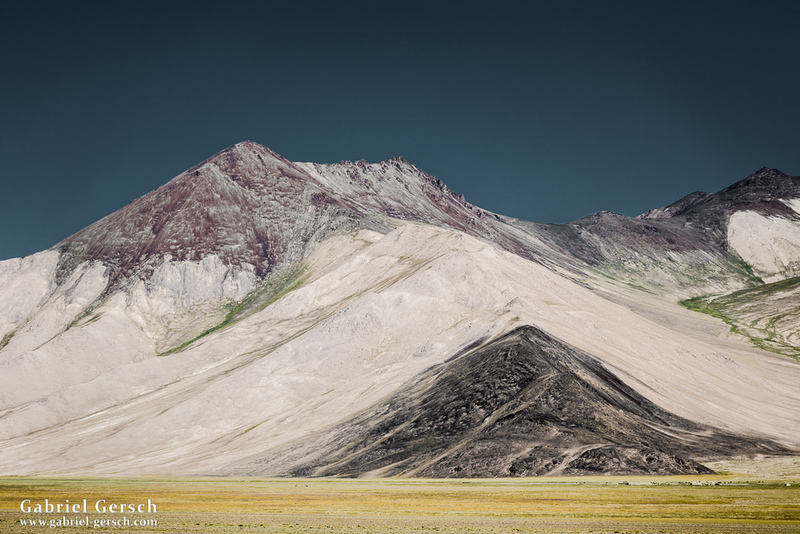 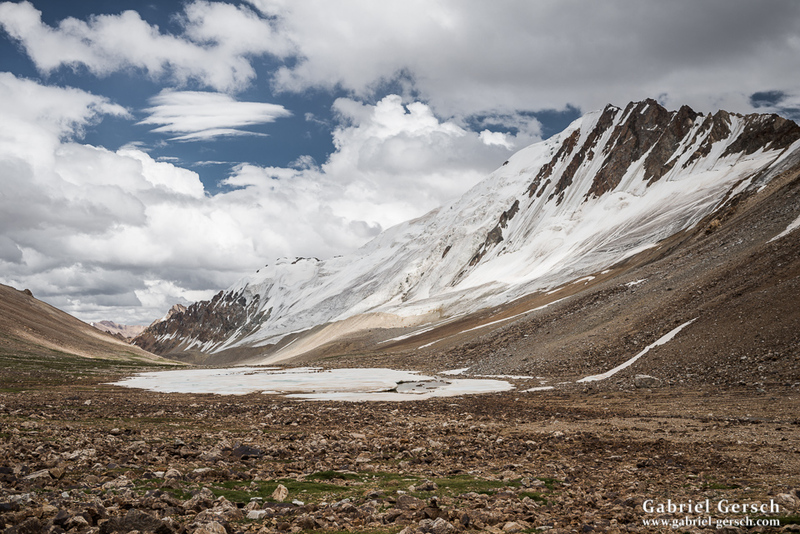 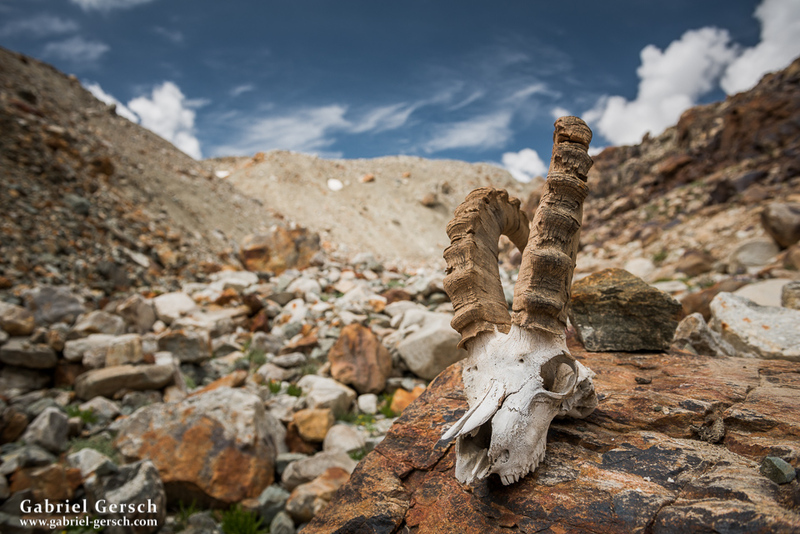 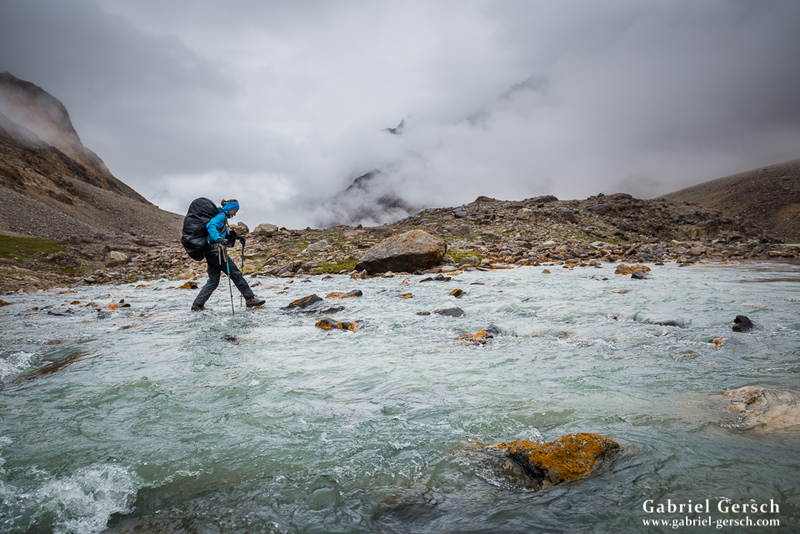 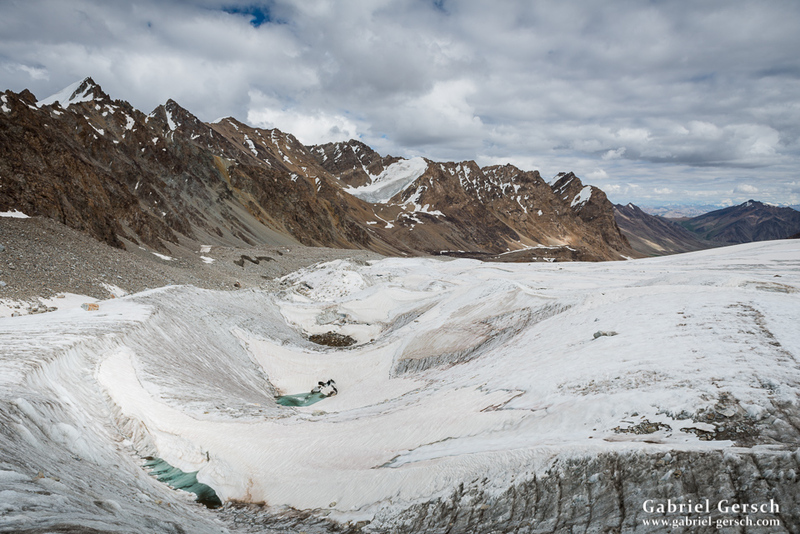 In mid-August, we went back to Khorog and along the Tajik-Afghan border (Wakhan Valley) all the way to Kyrgyzstan. 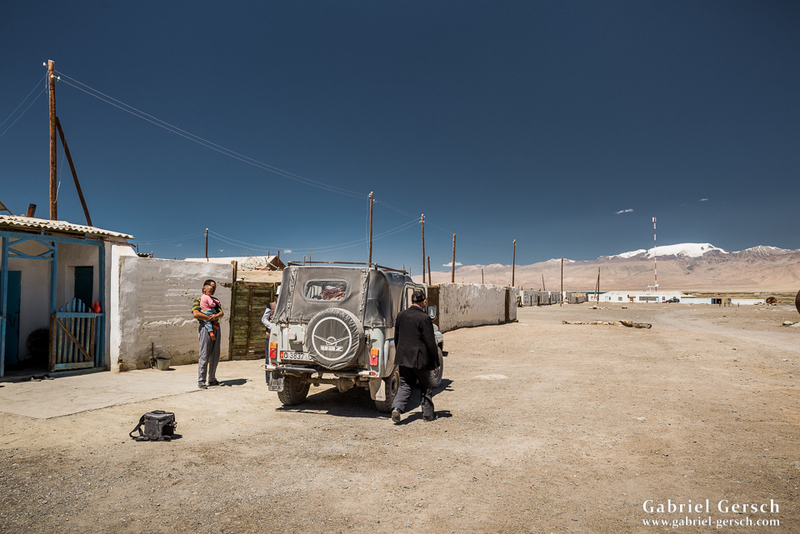 After we came back from our acclimatization trek, Sofia and I rested at our friends’ place in Varshedz for one day and then took a taxi to the small town of Bachor. 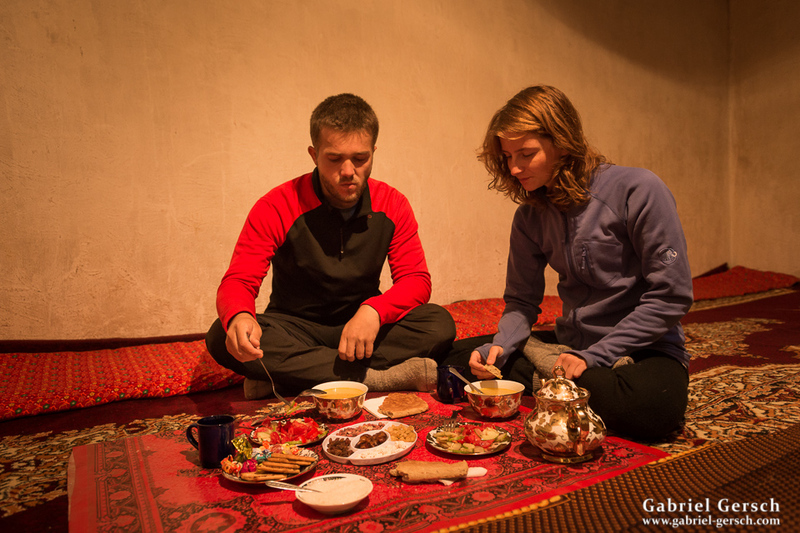 We slept at a homestay and enjoyed some traditional Pamir dishes before we took off on our 15-day hike in the Tajik National Park. 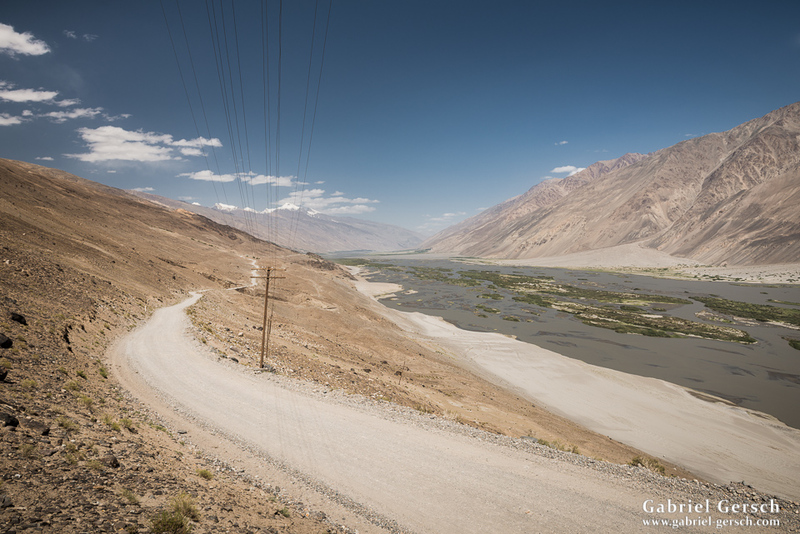 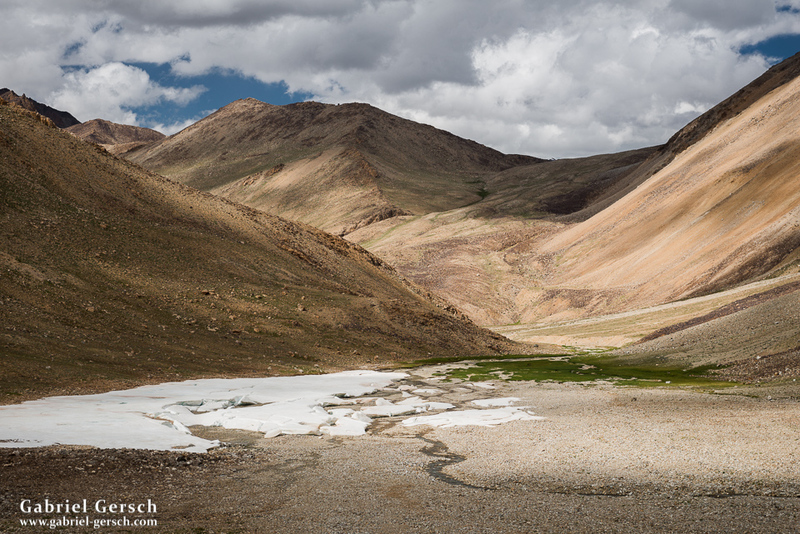 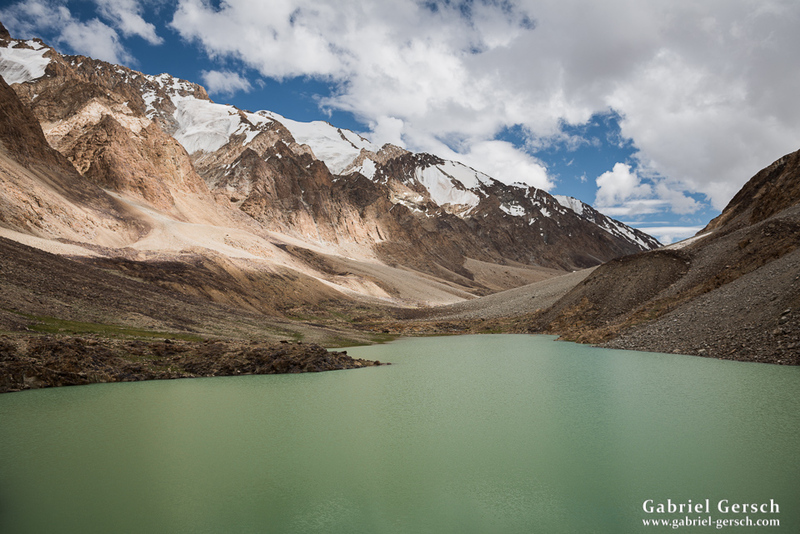 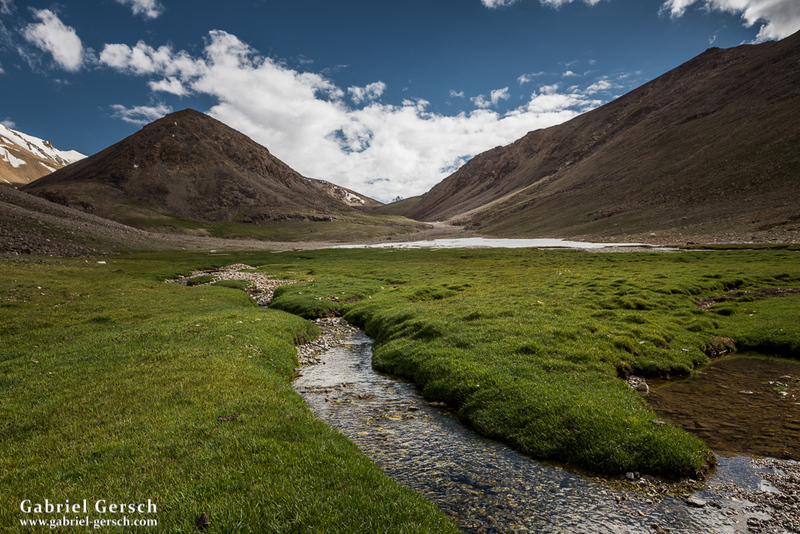 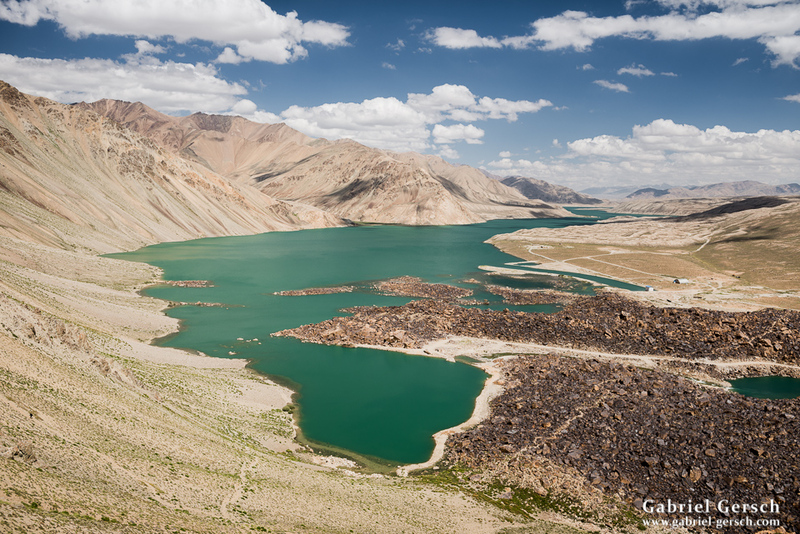 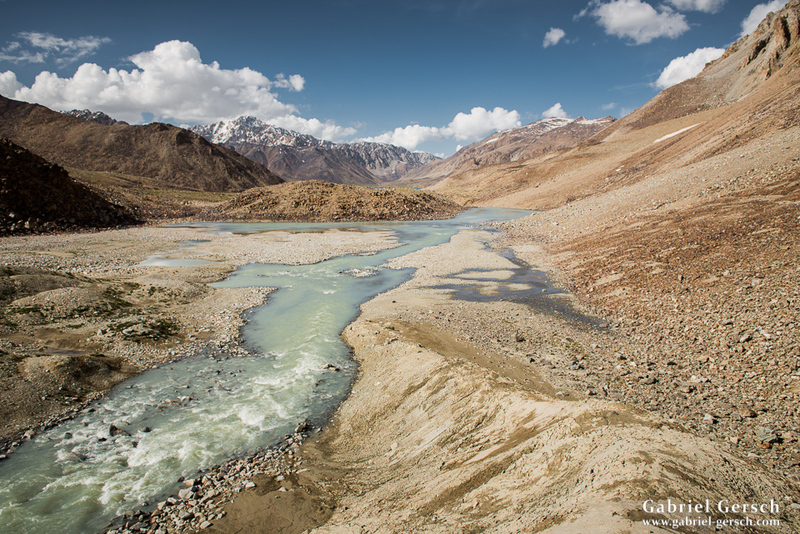 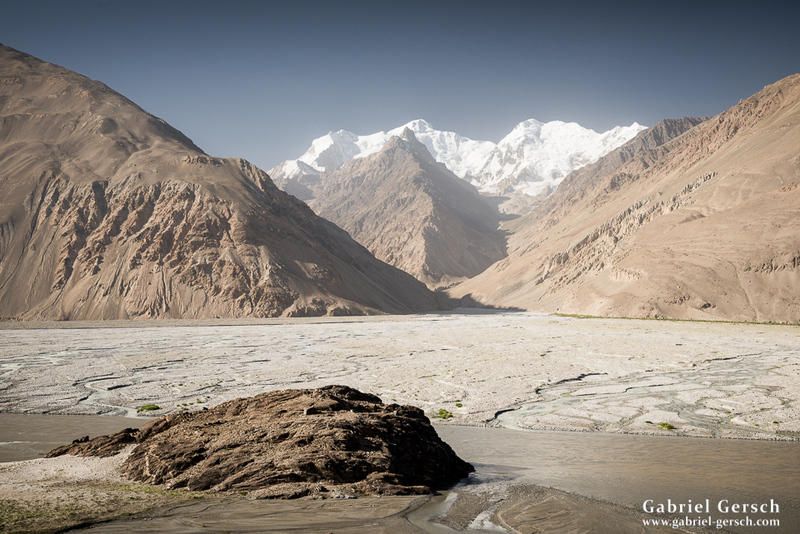 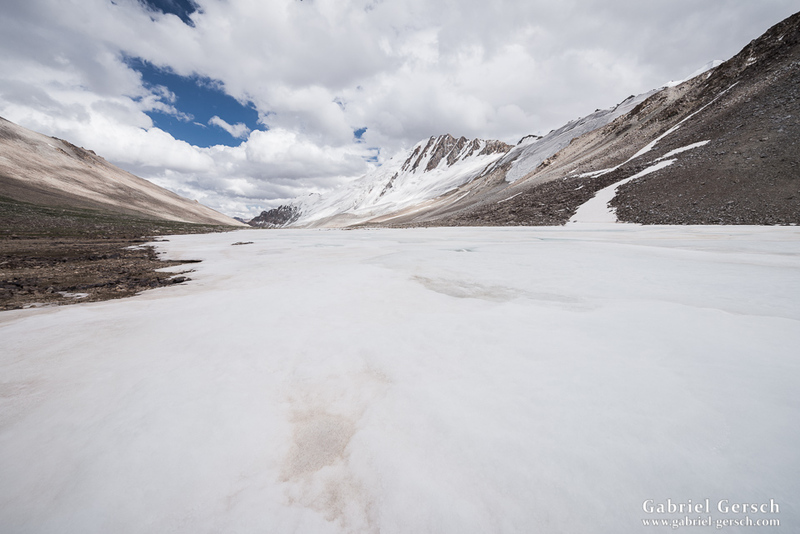 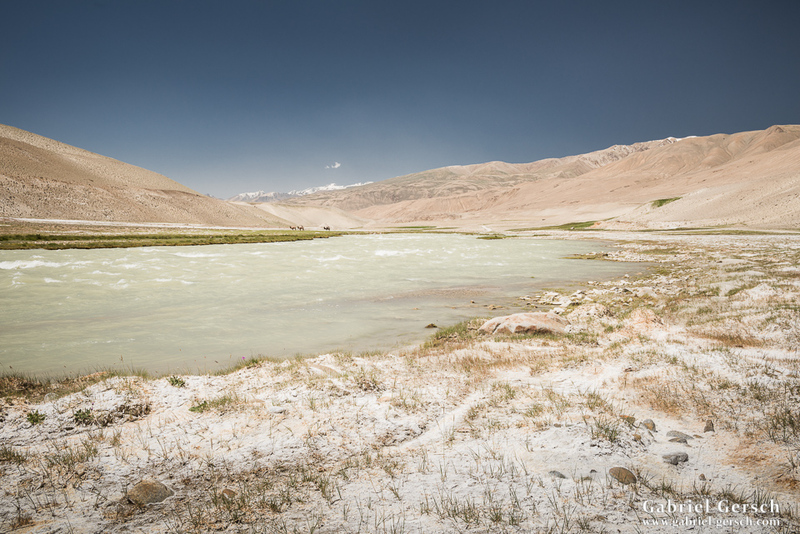 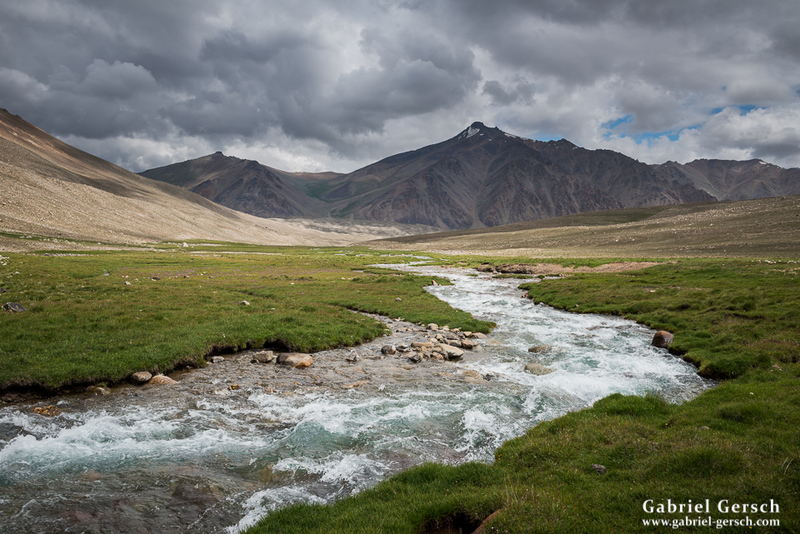 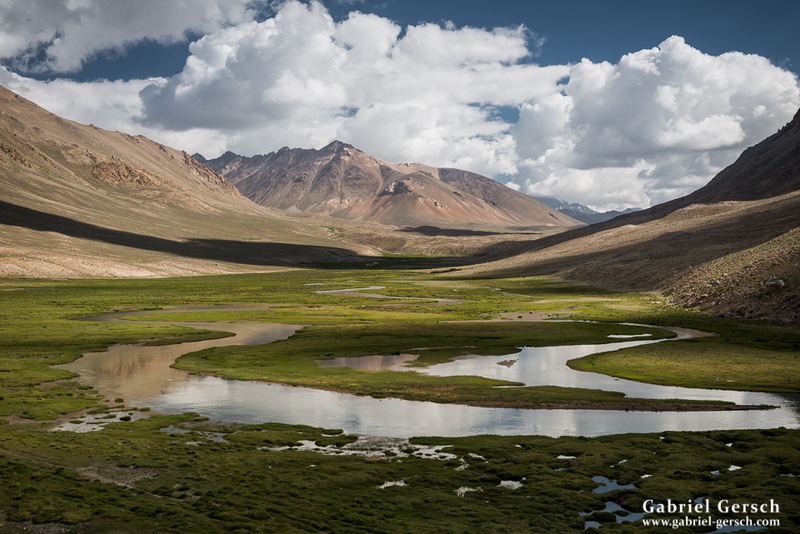 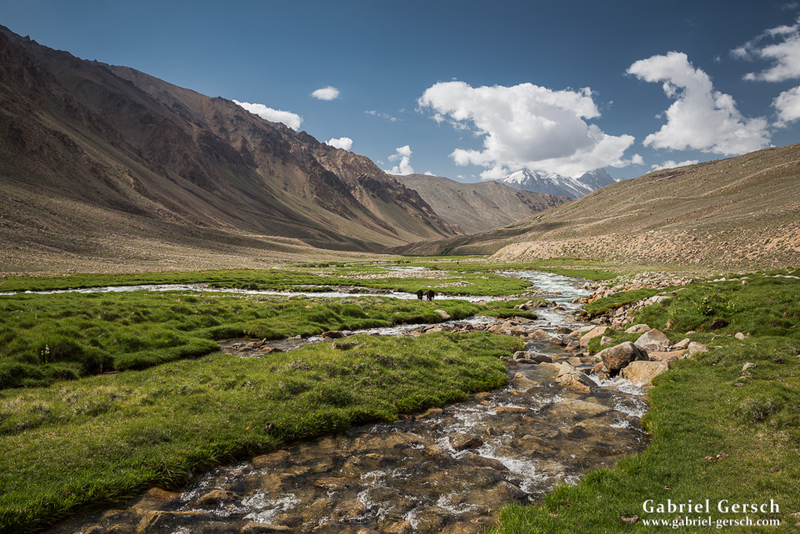 We followed the Ghund River for a few kilometers and then turned north into an open valley. 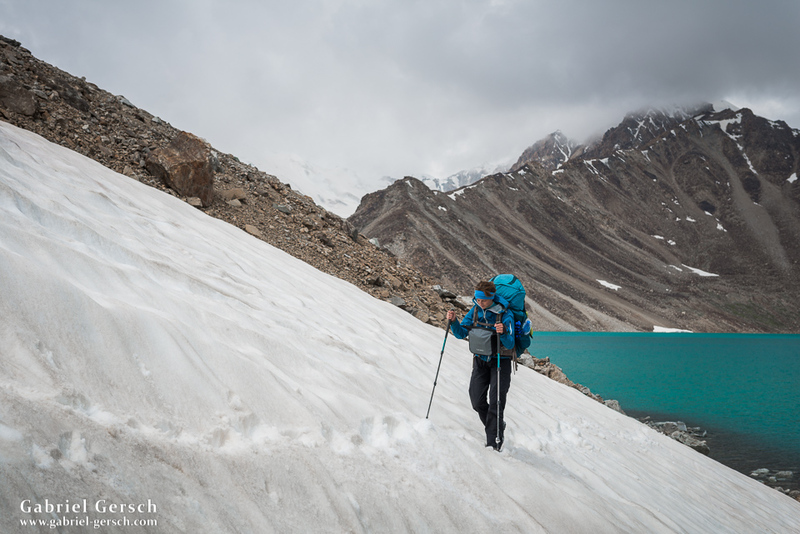 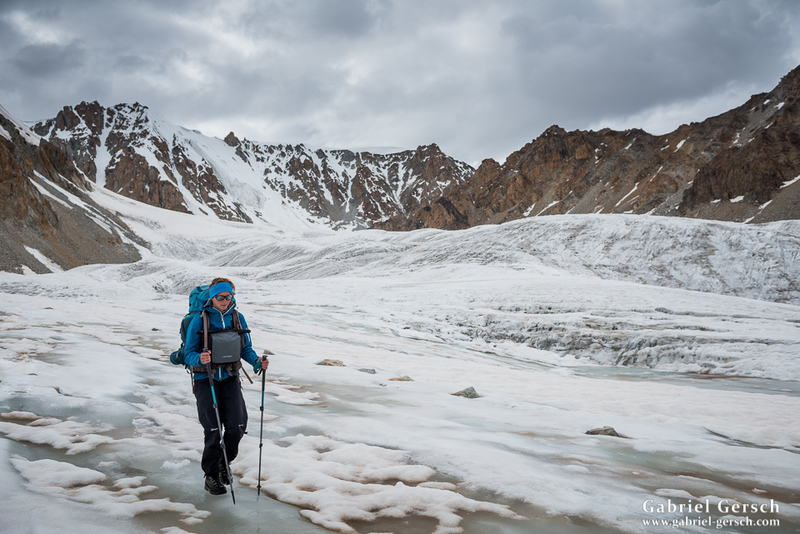 There is a direct way to the lake “Zarojkul” but Sofia and I took a detour via an unnamed pass at 4.600 m and plenty of moraine travel in the west. 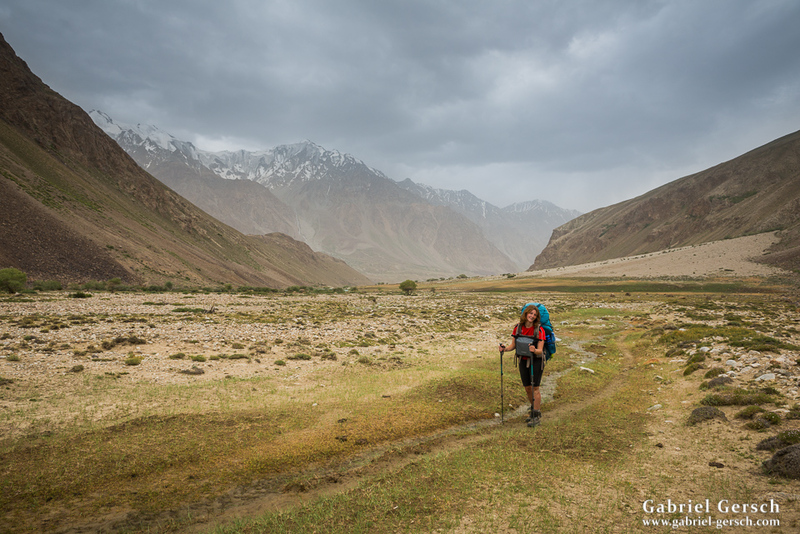 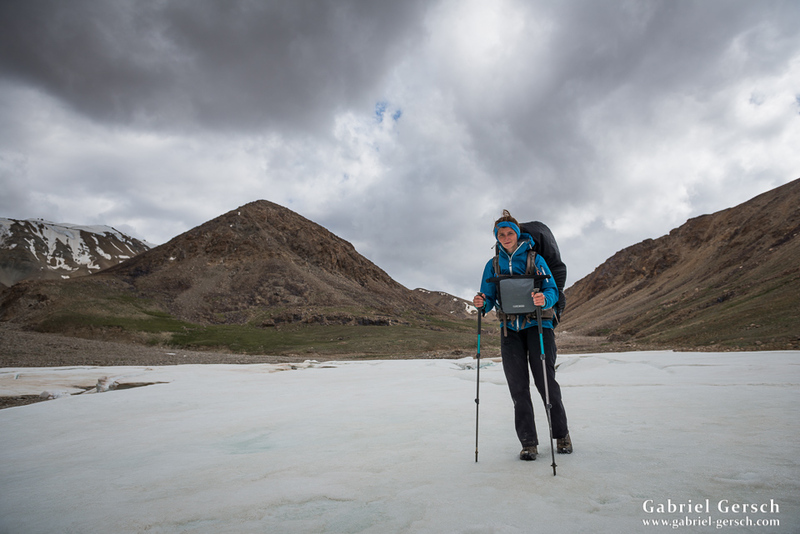 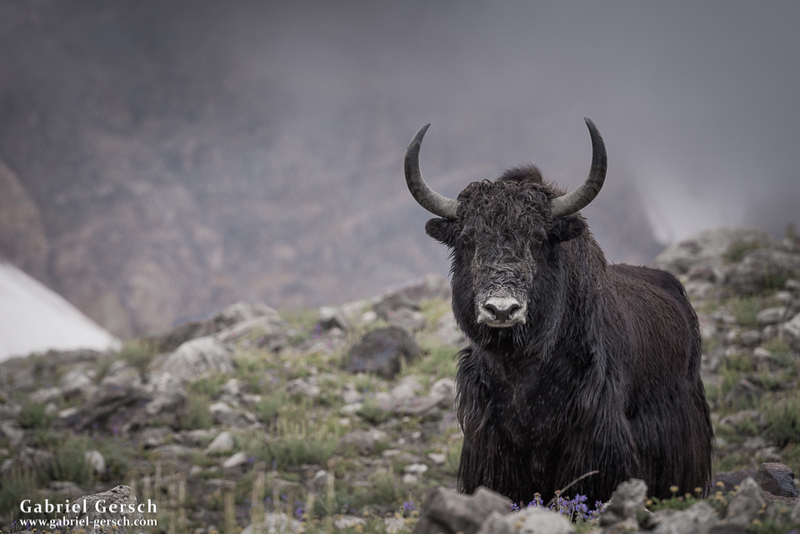 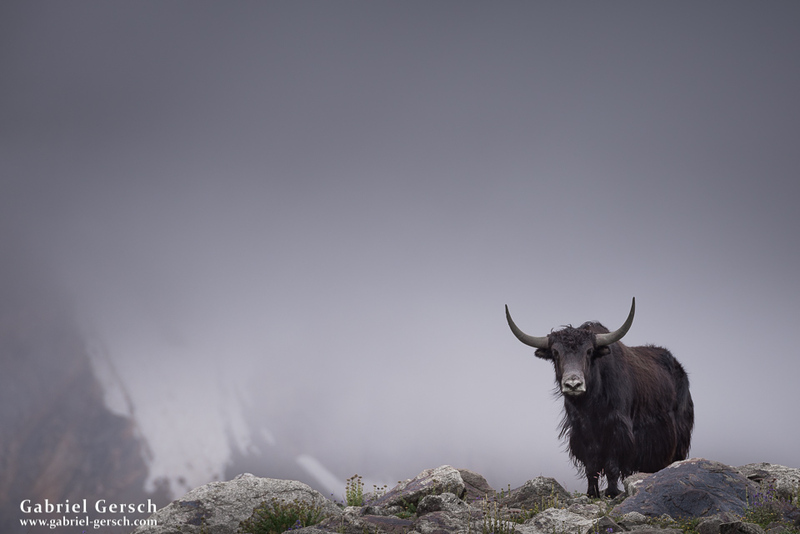 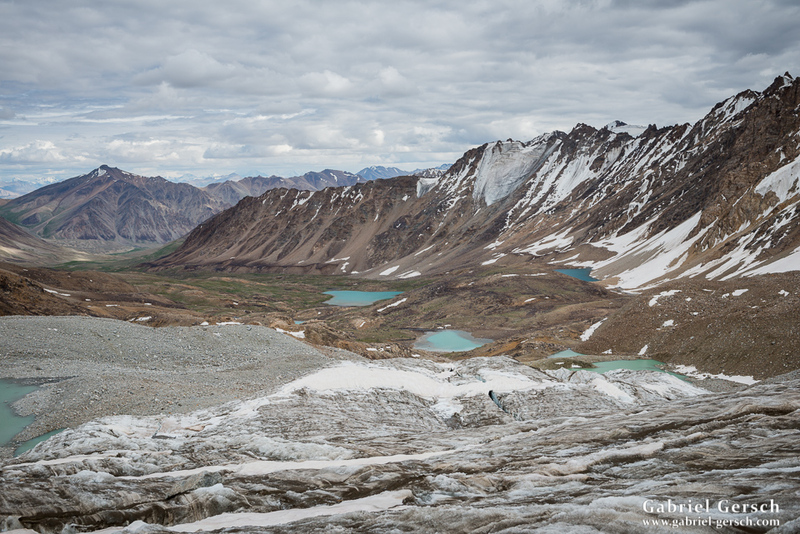 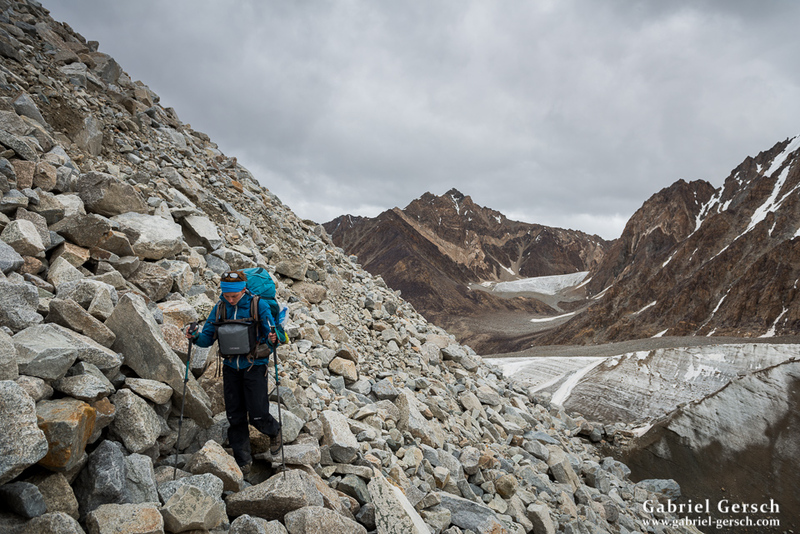 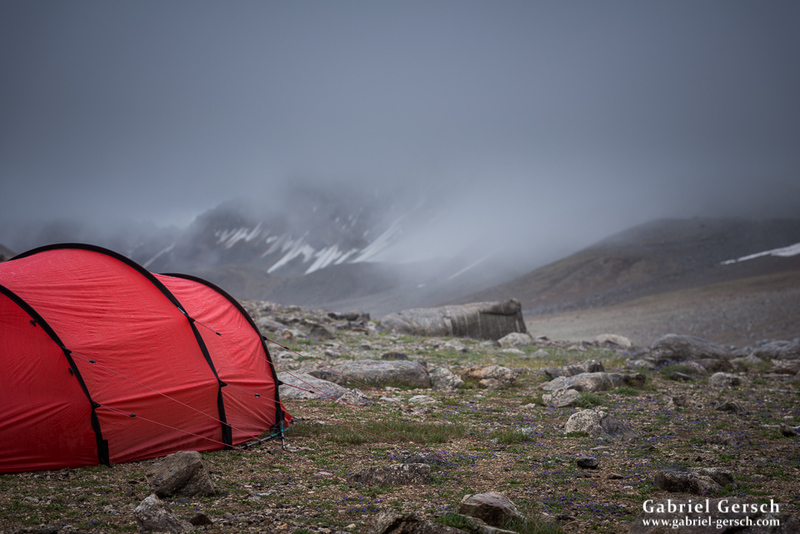 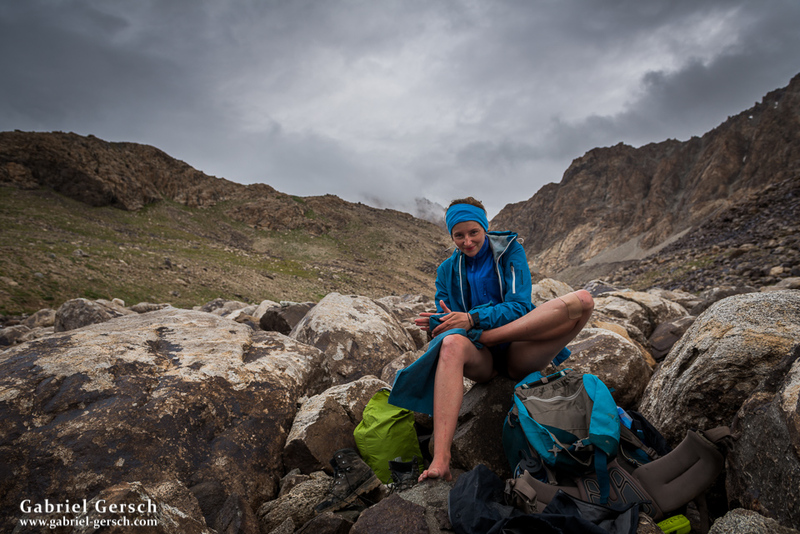 The rain and fog slowed us down a lot, so we reached Zarojkul on day four, July 25. 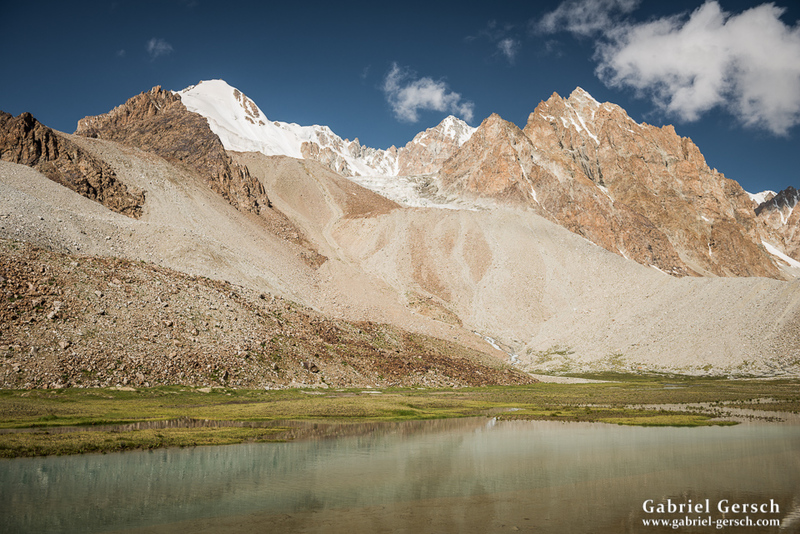 The walk along the south side of Zarojkul wasn’t easy, but we safely managed to get to its south-eastern end. 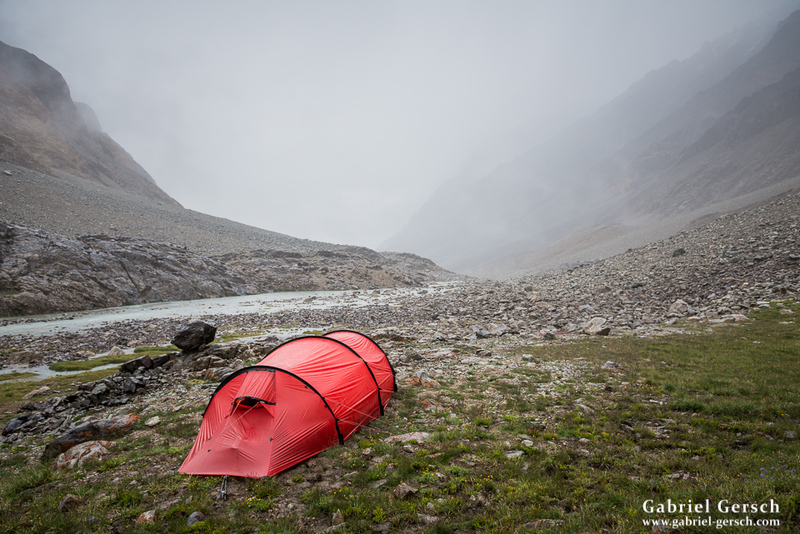 A few hours later it started to rain heavily, so we decided to camp and save the difficult river crossing for the next morning. 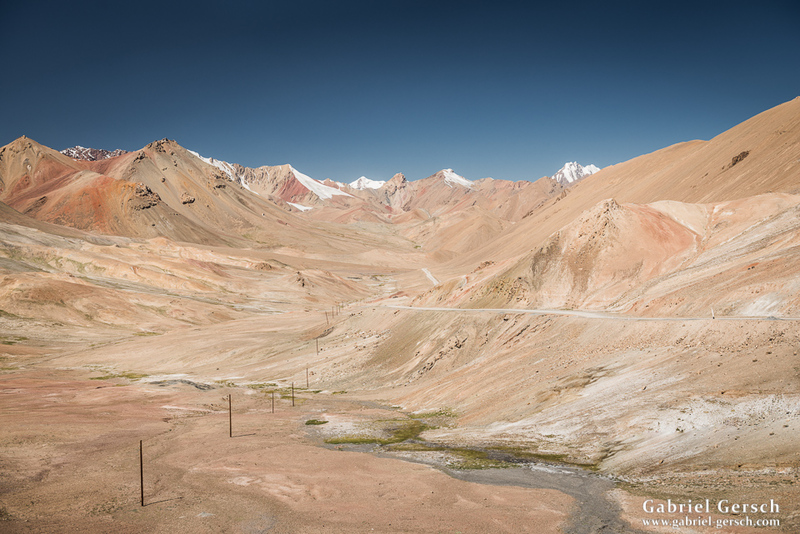 We climbed up a 4.715 m pass and caught some sunshine on the other side. 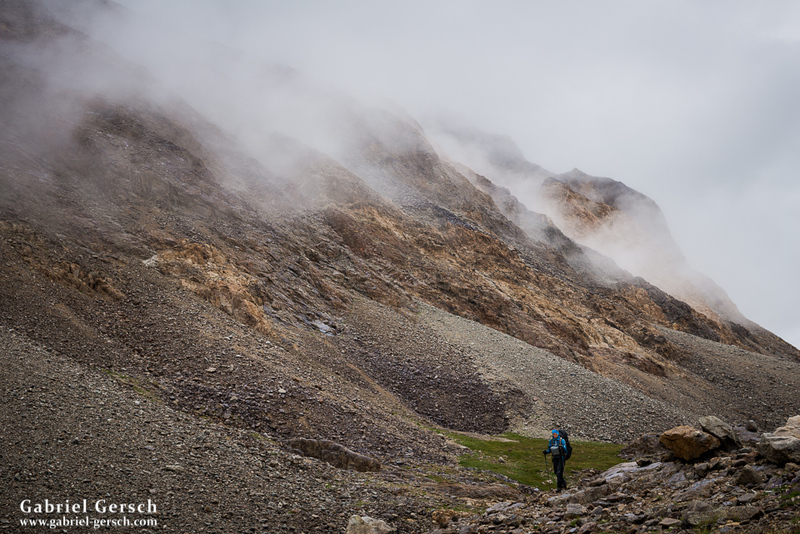 Then it started to rain again and we hiked in bad weather conditions for several days. 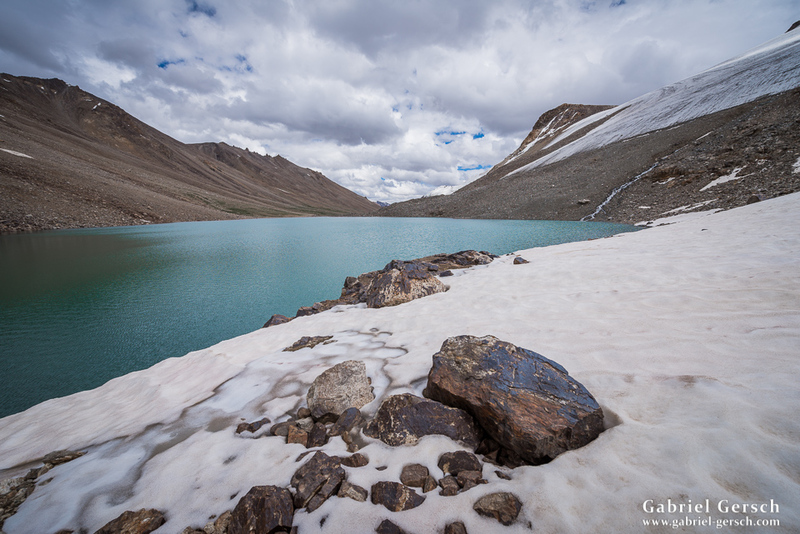 After another pass and a number of lakes, including Chapdar Lake, we finally reached the base of our last high pass on this route. 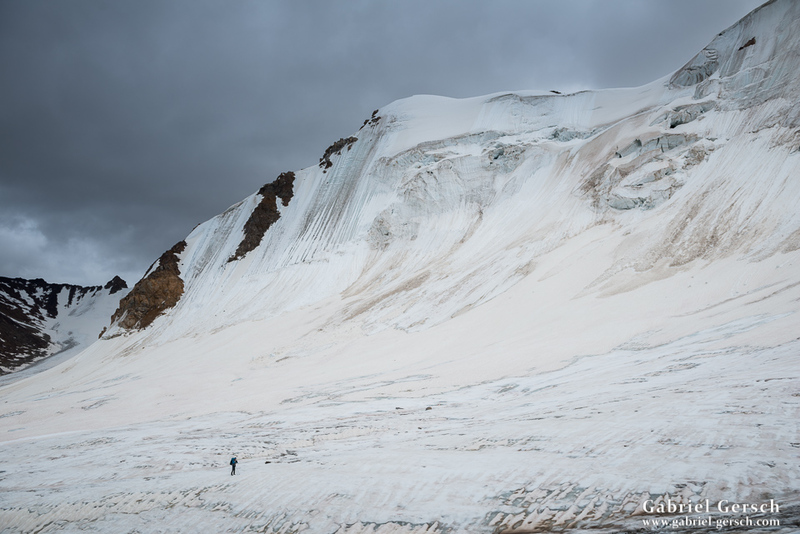 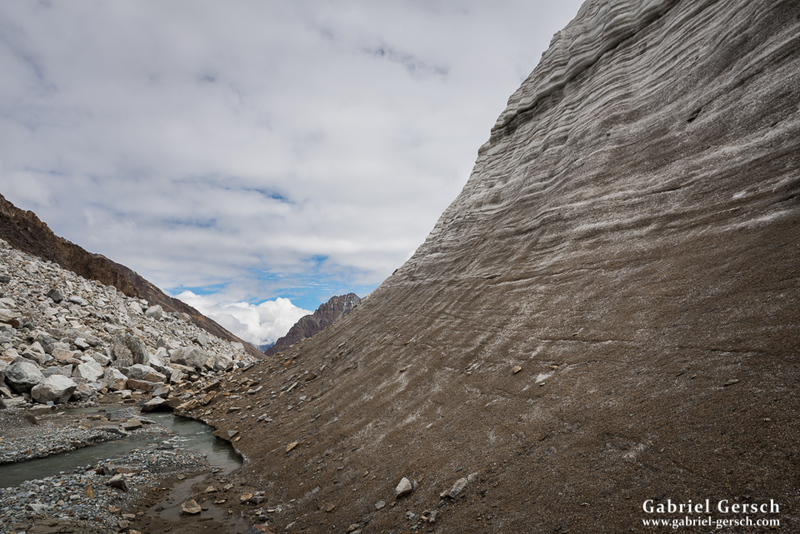 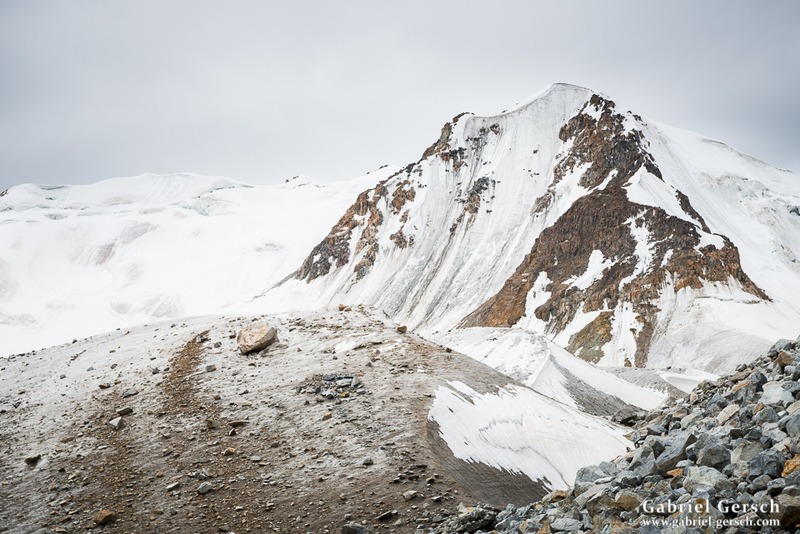 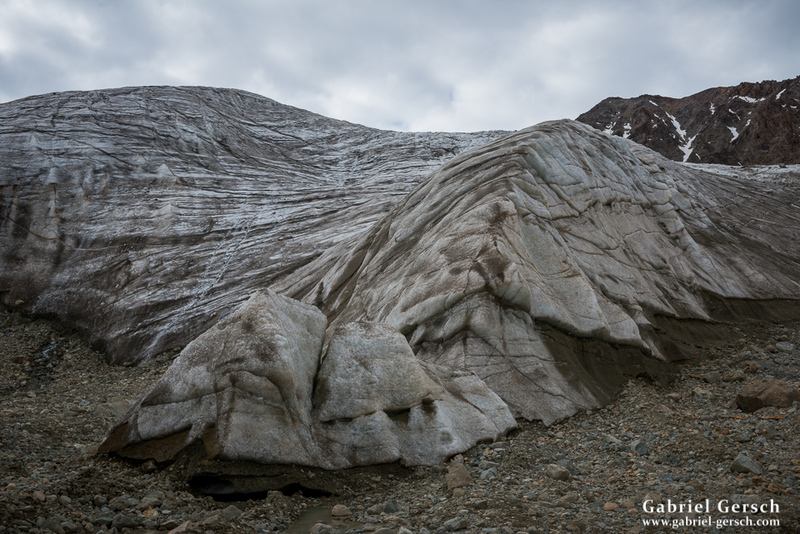 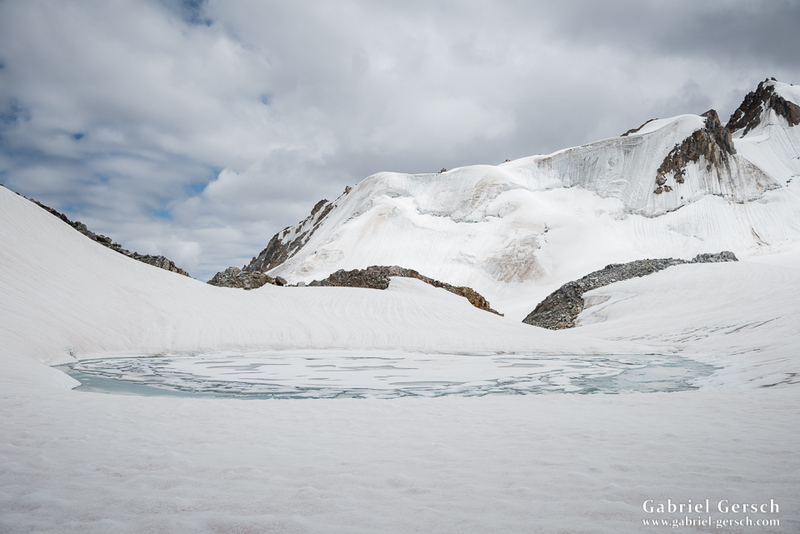 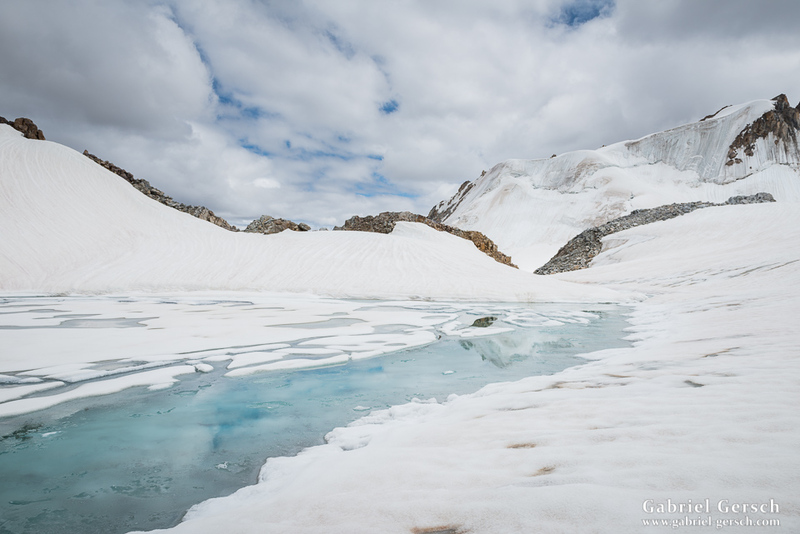 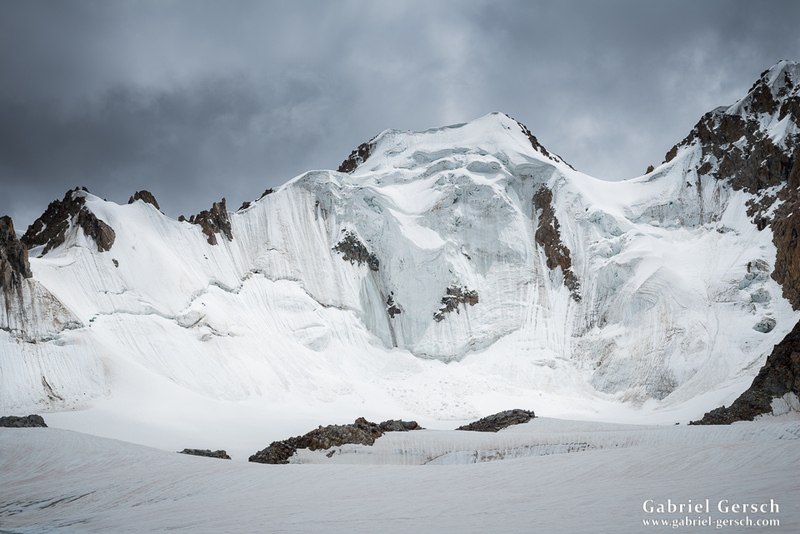 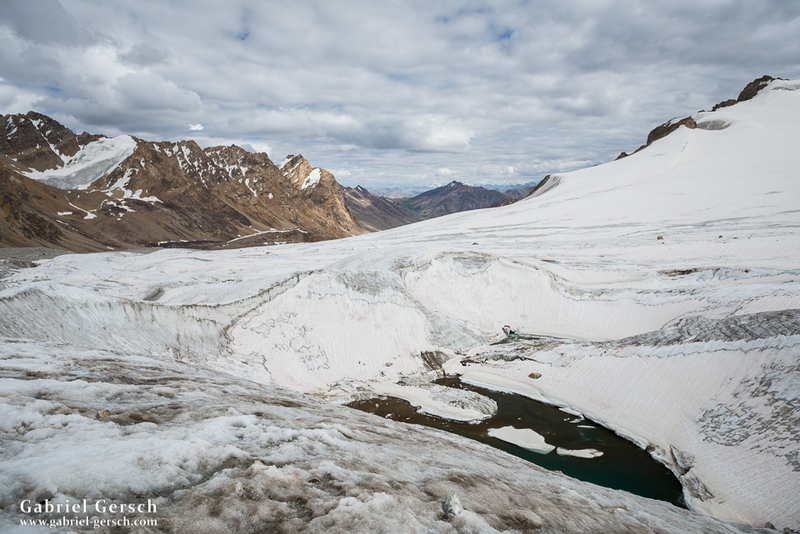 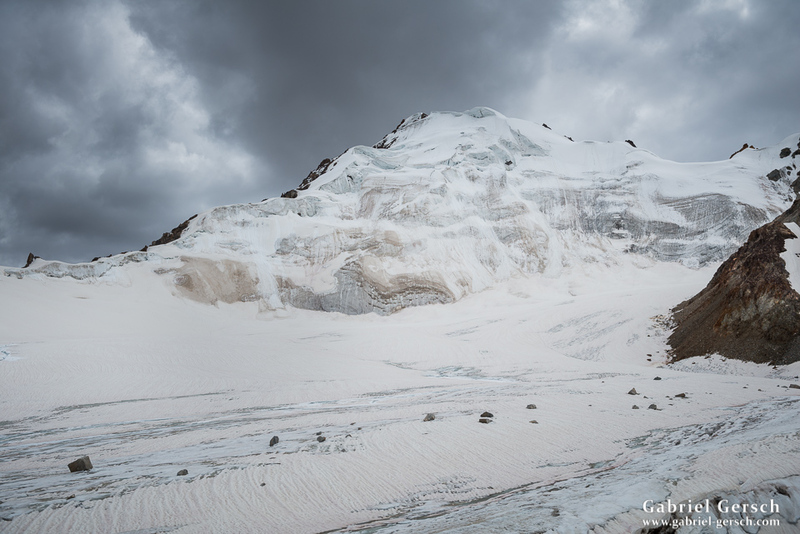 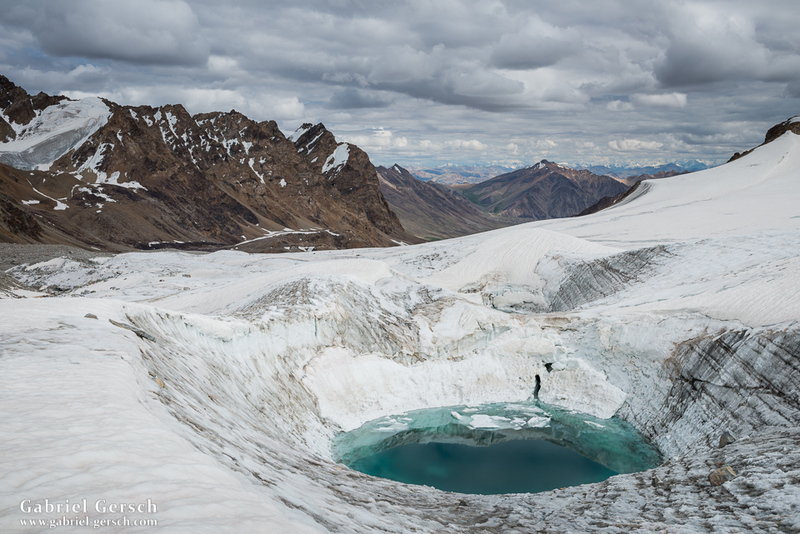 The pass we now had to climb was 5.040 m high and heavily glaciated while parts of the ice were covered in snow. 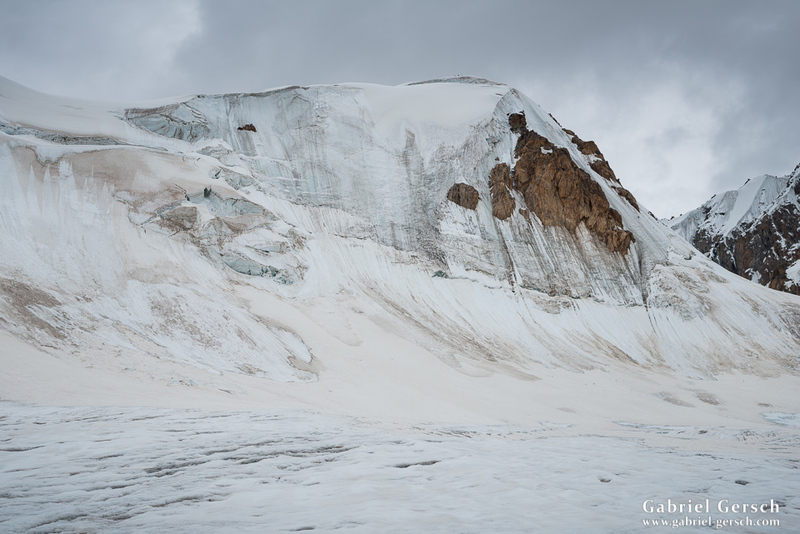 The snow made traveling not only difficult but also a lot more dangerous since the crevasses were barely visible. 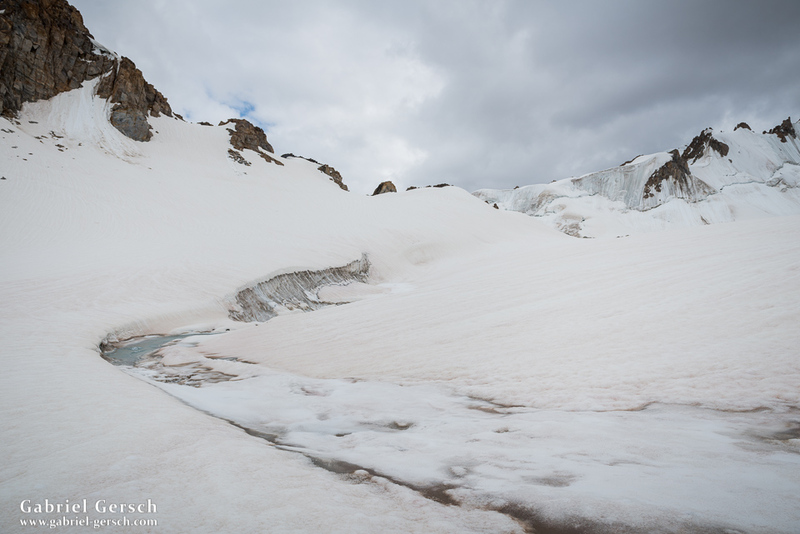 So we waited for better weather and crossed the pass on August 4 in acceptable conditions. 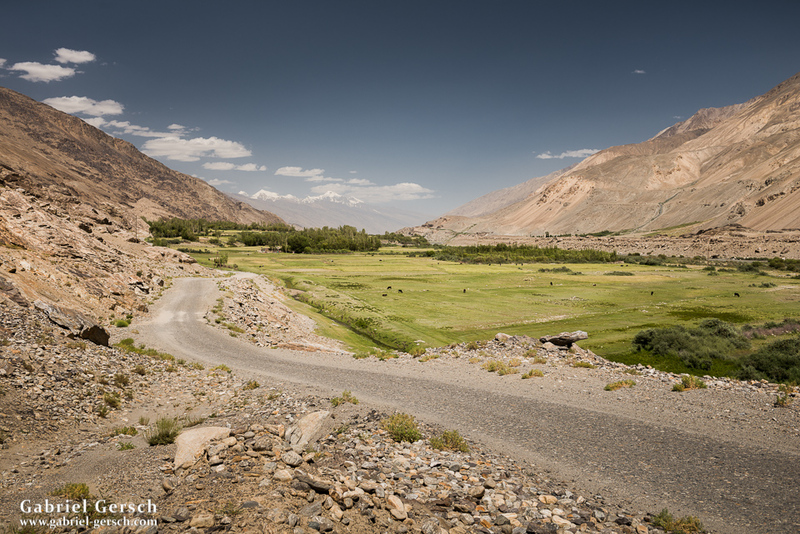 The way back to Bachor took us three days. 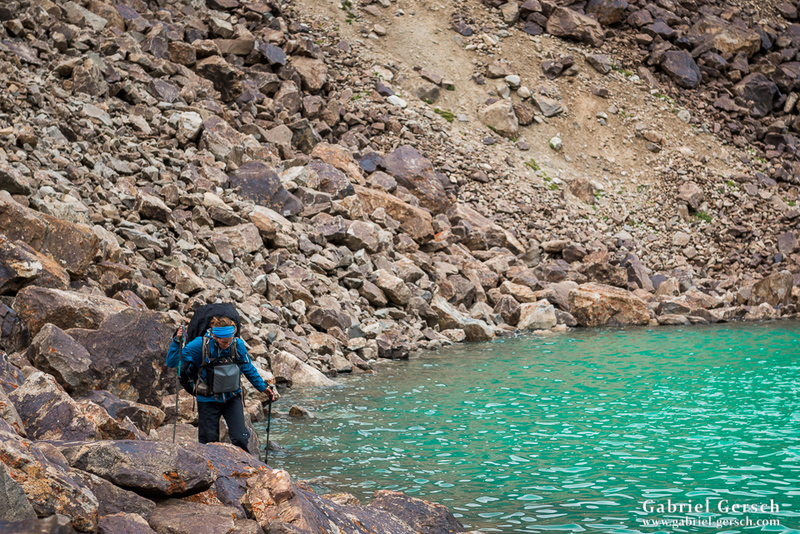 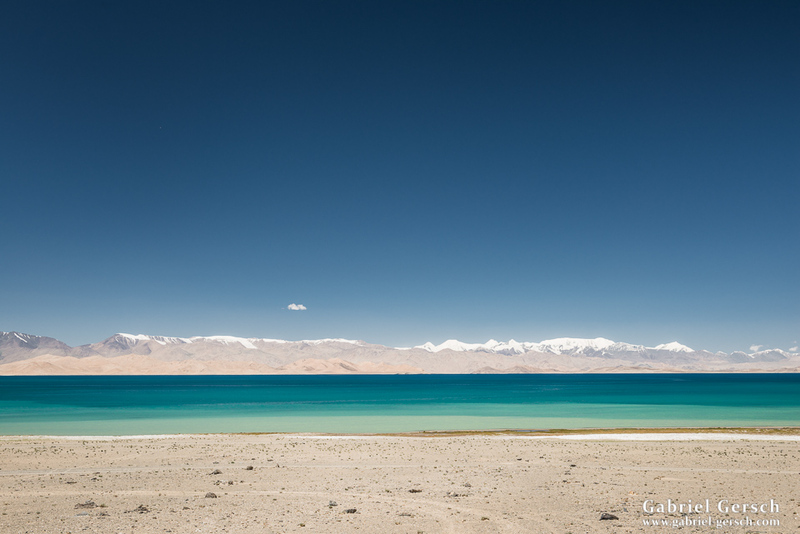 When we reached Yashikul, the sun was shining and Sofia took a bath in the lake. 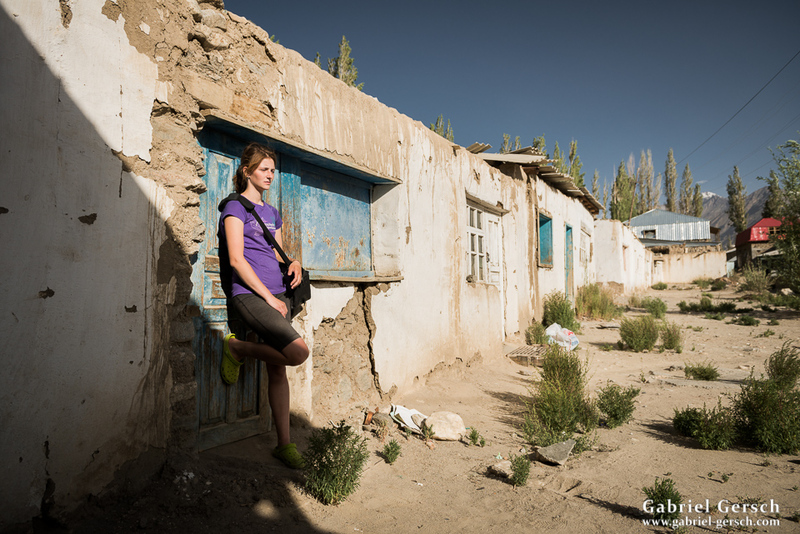 On the 15 we reached the village and were looking forward to get some rest in our homestay. 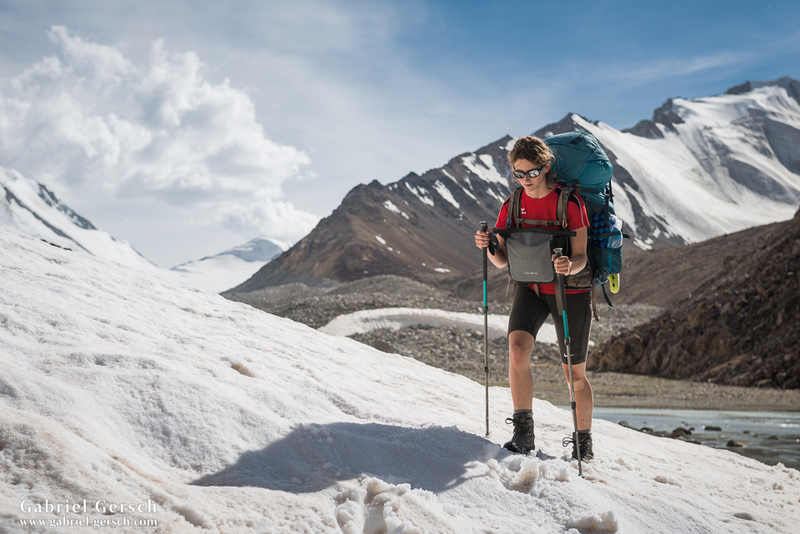 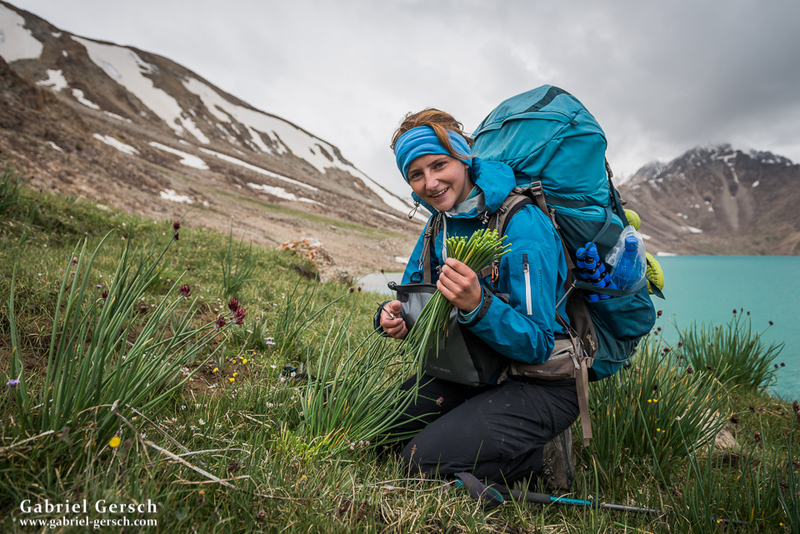 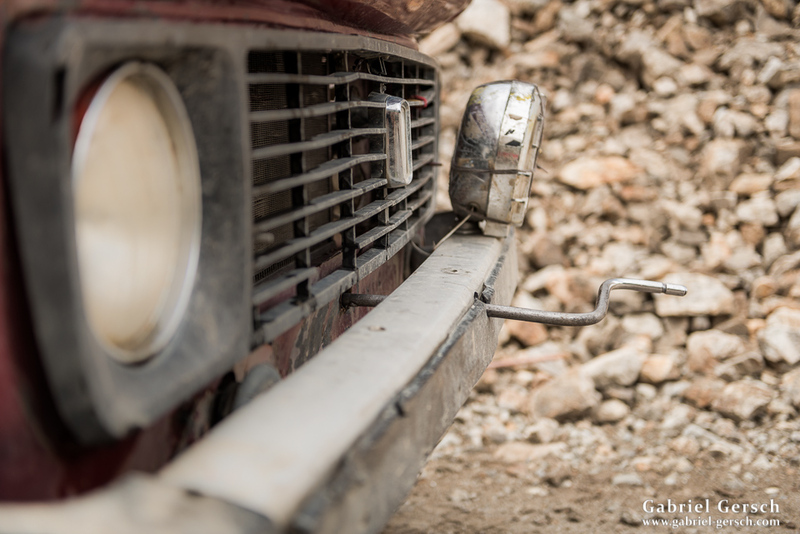 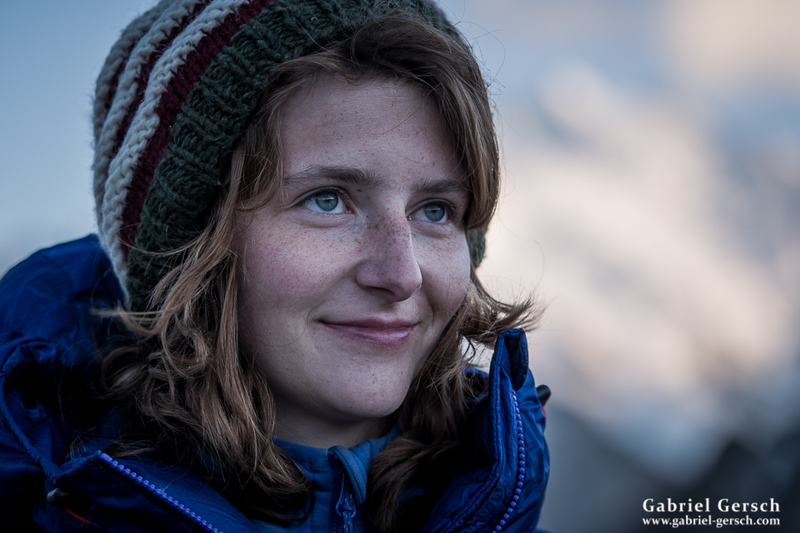 But that didn’t happen – instead, Sofia noticed that she had forgotten some essential tool during our last lunch break on the trek, so we spent an extra day to go back and collect what she had left there. 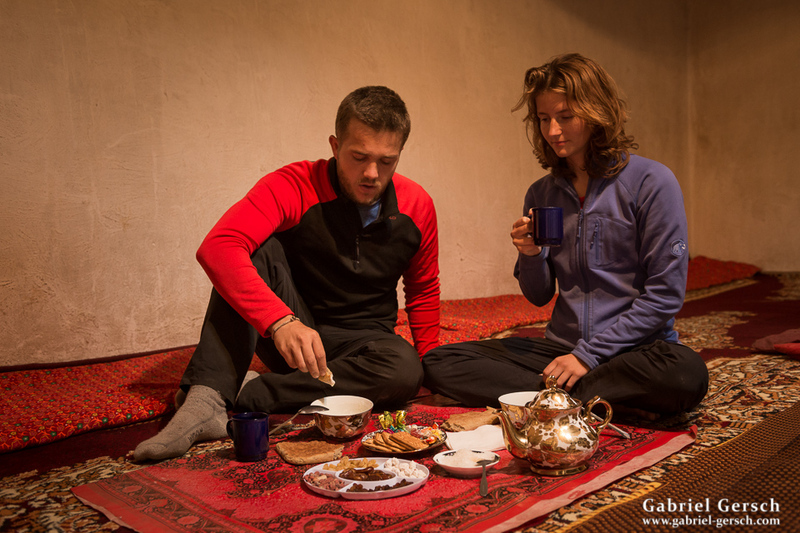 Anyway, eventually we had a hot shower, a big meal and even washed our clothes in Bachor, so everything was fine. 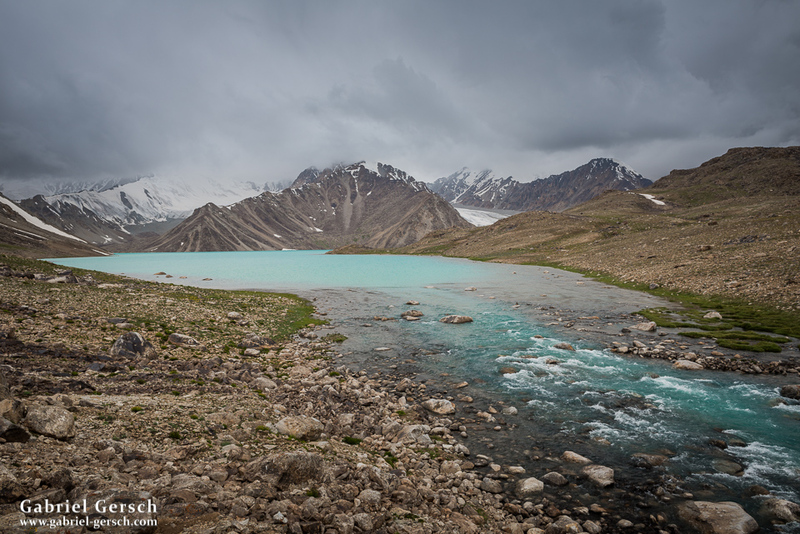 We went back to Varshedz and continued to Khorog via taxi and boat. 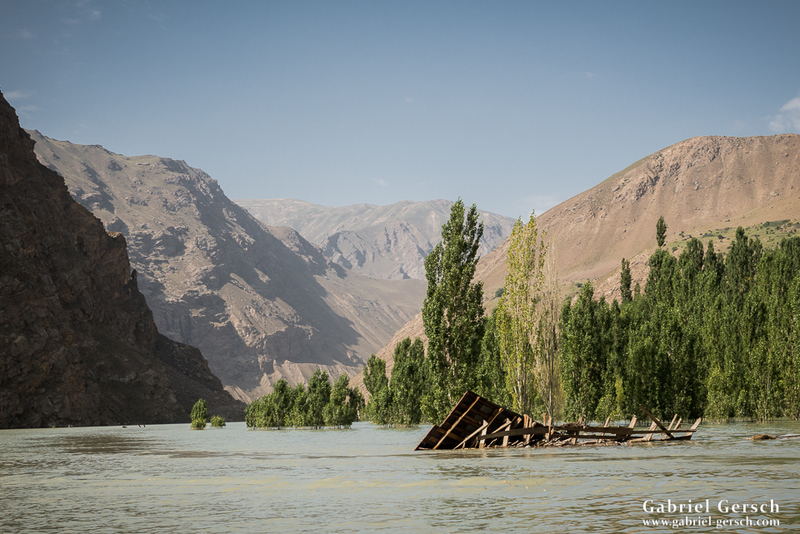 The boat was necessary to maneuver across a big lake that hadn’t been there when we drove along the Pamir Highway a few weeks earlier. 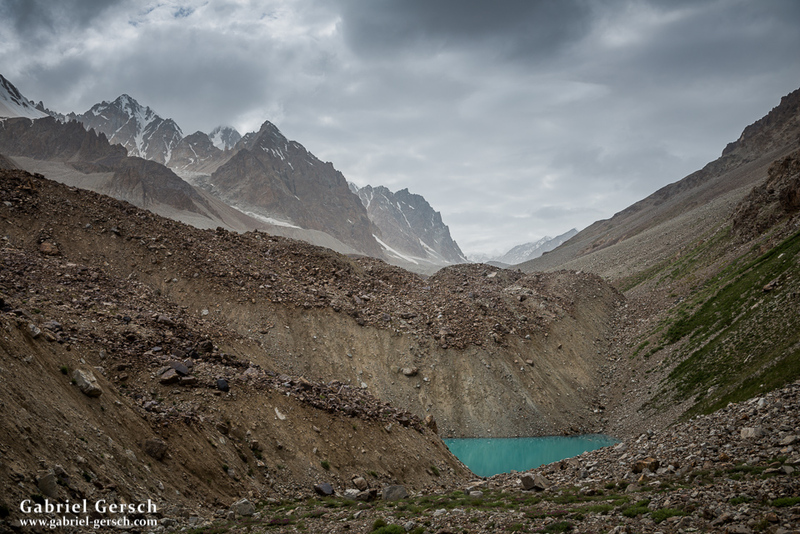 In the meantime, a landslide had occurred in the town of Barsem; it destroyed the entire village and formed a lake that washed away the highway. 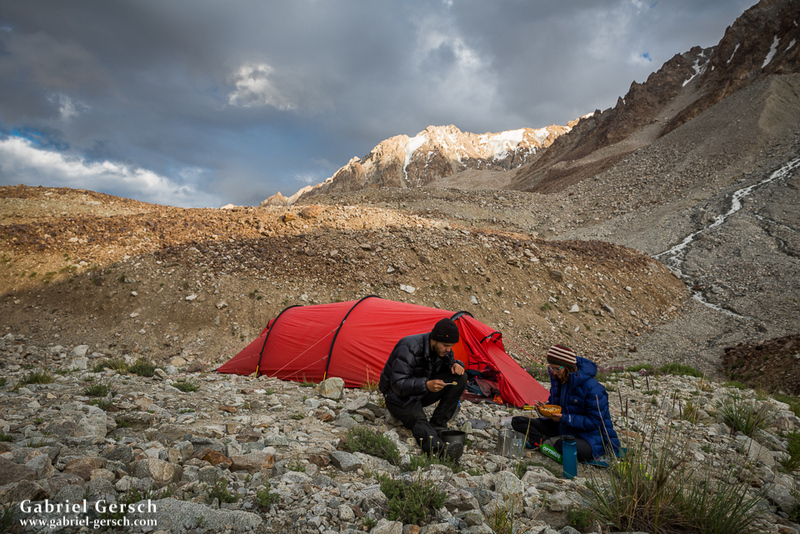 In Khorog we spent a few days with our friends and their friends. 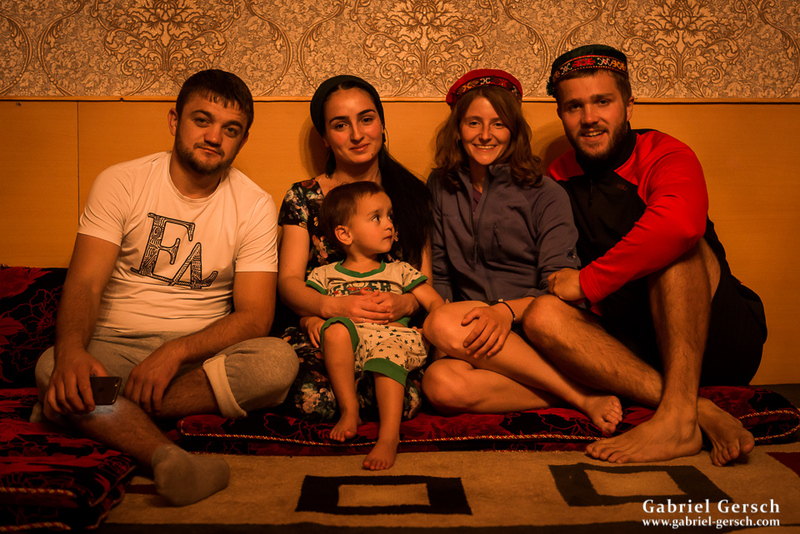 These people hosted us, fed us, took us to some local events and even gave us presents before we left. 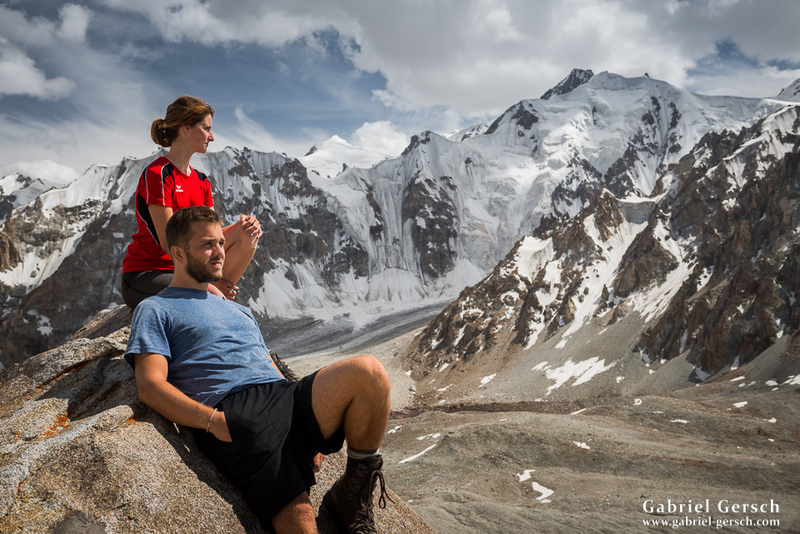 We greatly enjoyed their hospitality and promised to come back one day. 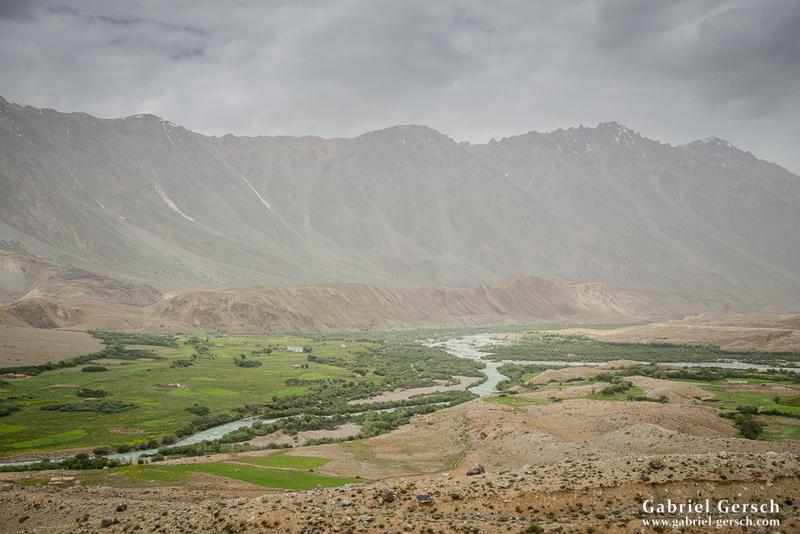 From Khorog we took a bus to Ishkashim and from there hitched a ride into the Wakhan valley at the Tajik-Afghan border. 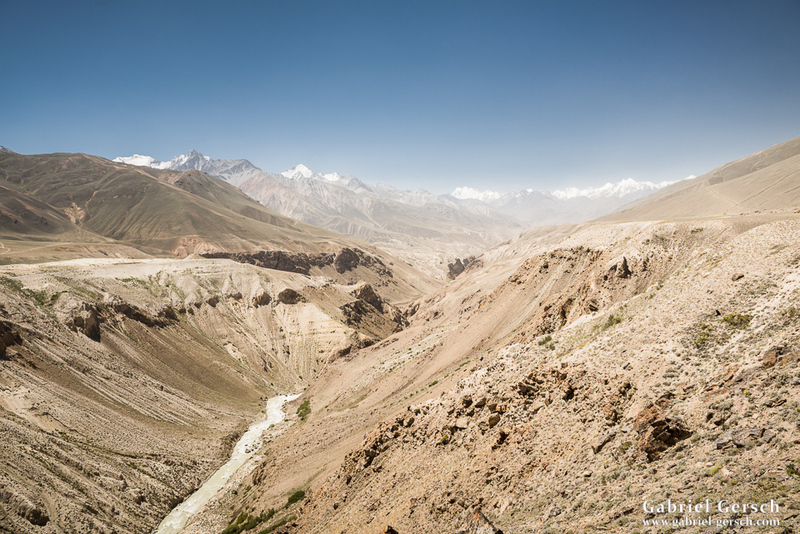 The views were amazing; to the south one could even see the Hindukush. 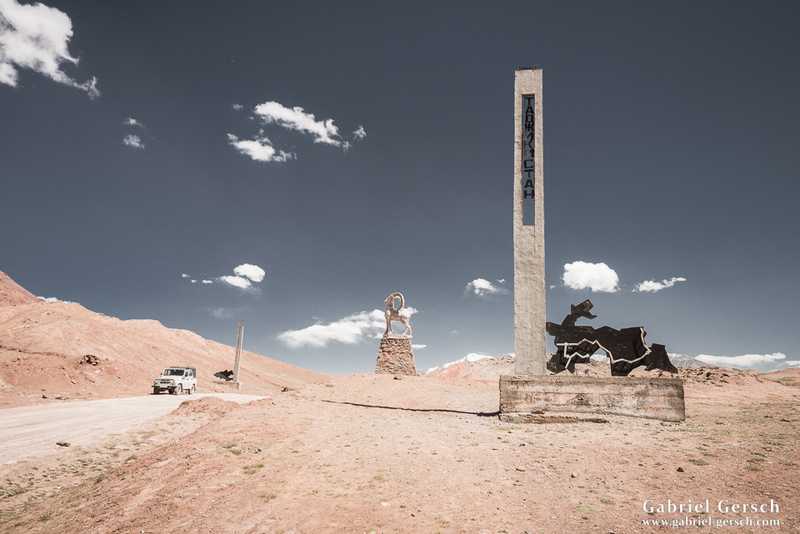 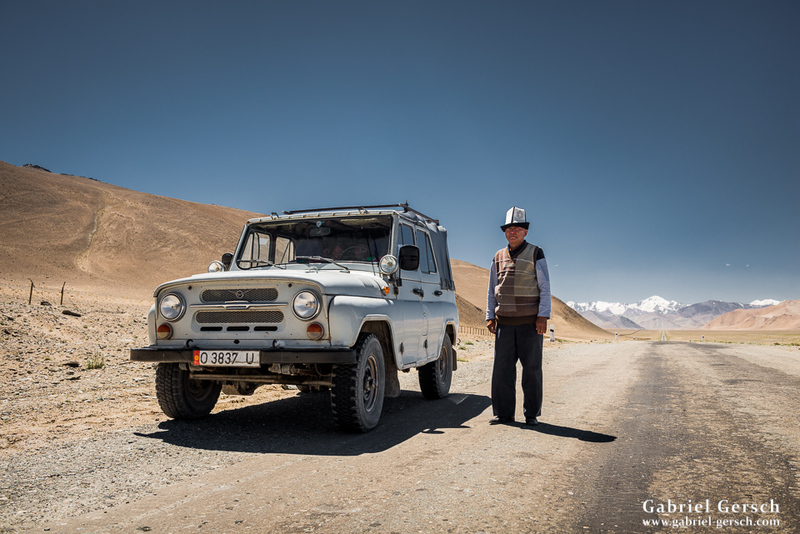 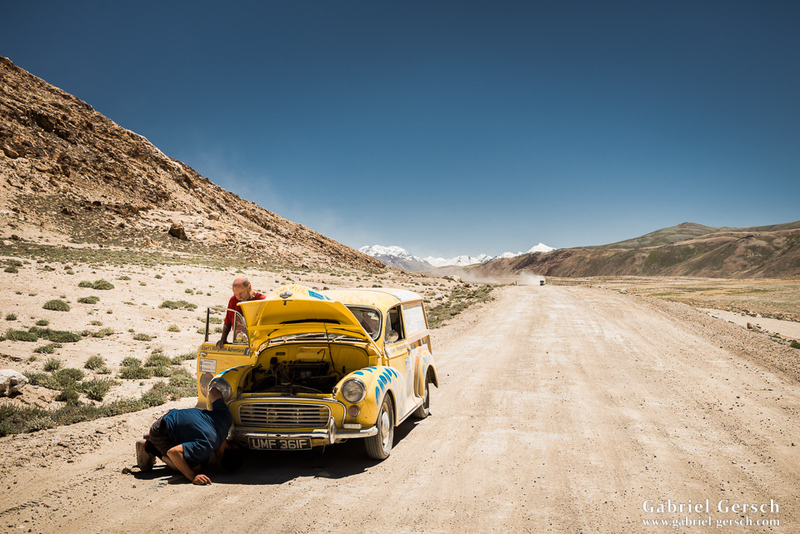 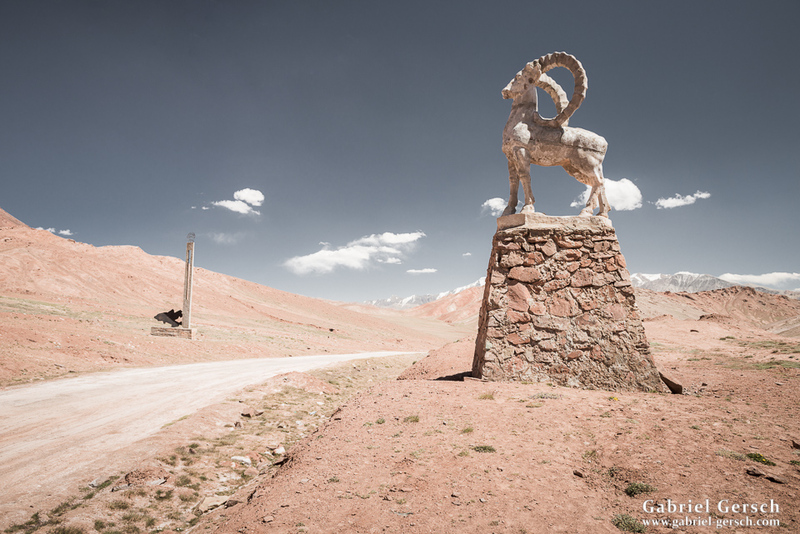 After a visit of the antique Yamchun Fortress and the Bibi Fatimah Hot Springs, we continued our journey via Langar, Alichur, Murghab, Karakul and all the way to the Kyrgyz border. 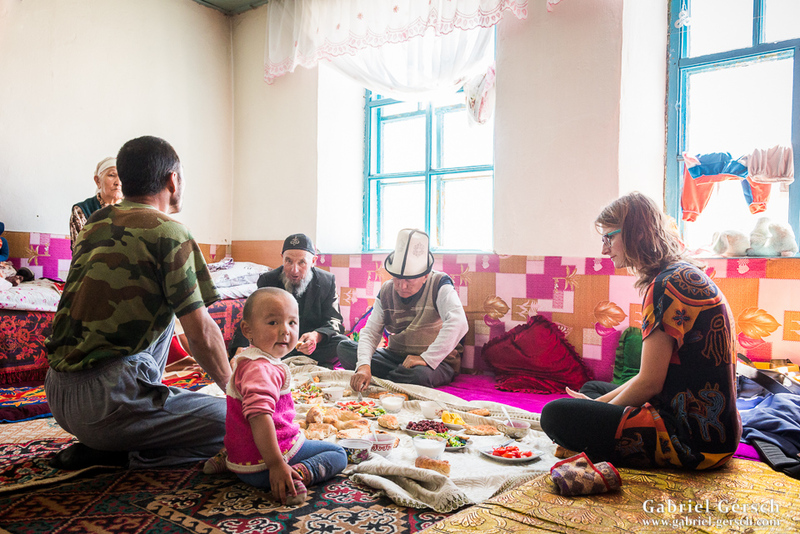 Wherever we stayed, we met wonderful people who invited us to their homes and prepared the most delicious traditional dishes for us. 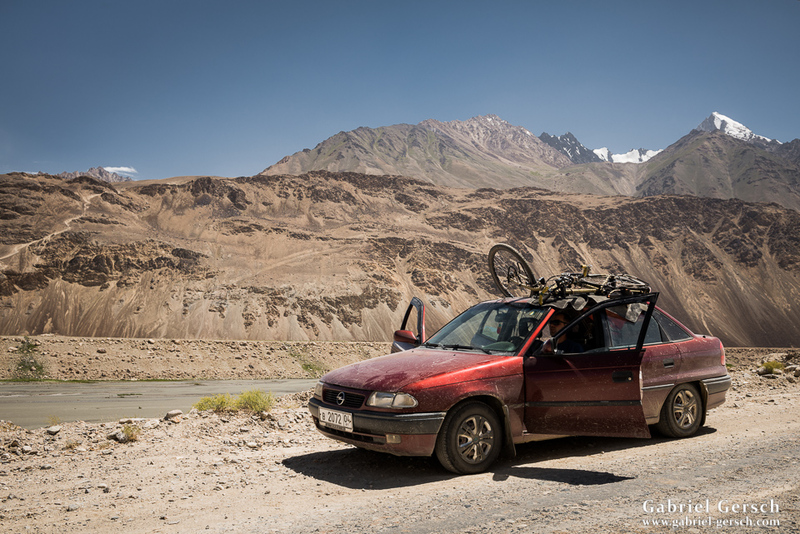 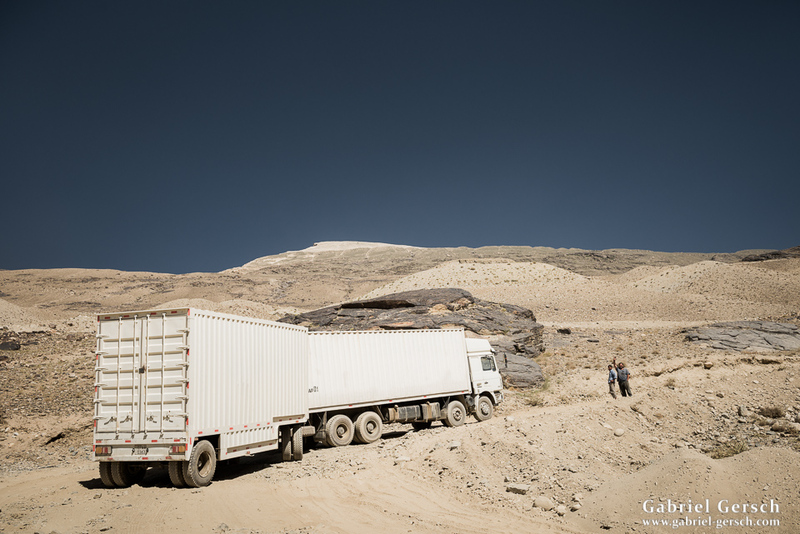 After we spent 35 days in the country, we left Tajikistan on August 15. 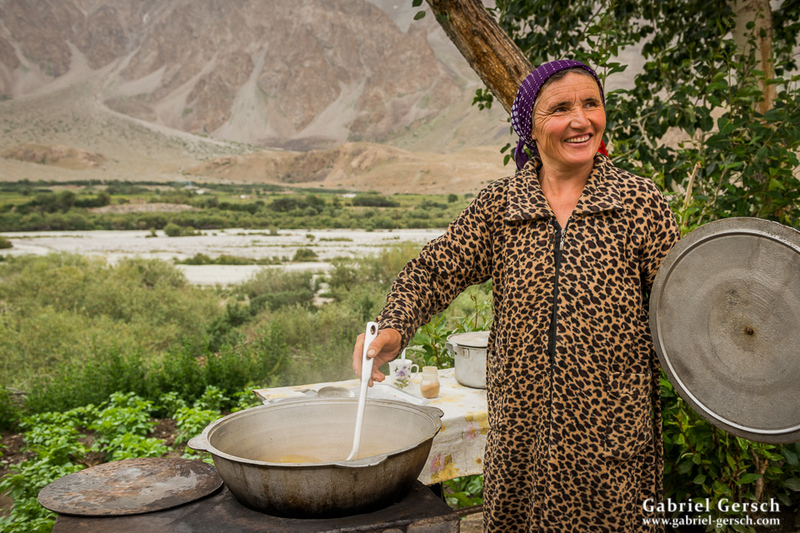 I’m not quite sure why Tajikistan sees only so little visitors from foreign countries. 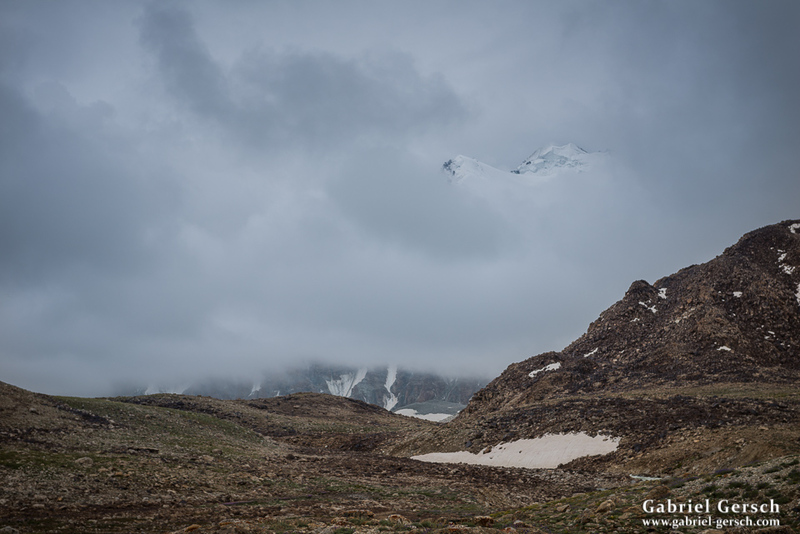 The mountains are beautiful, wild and unspoiled. 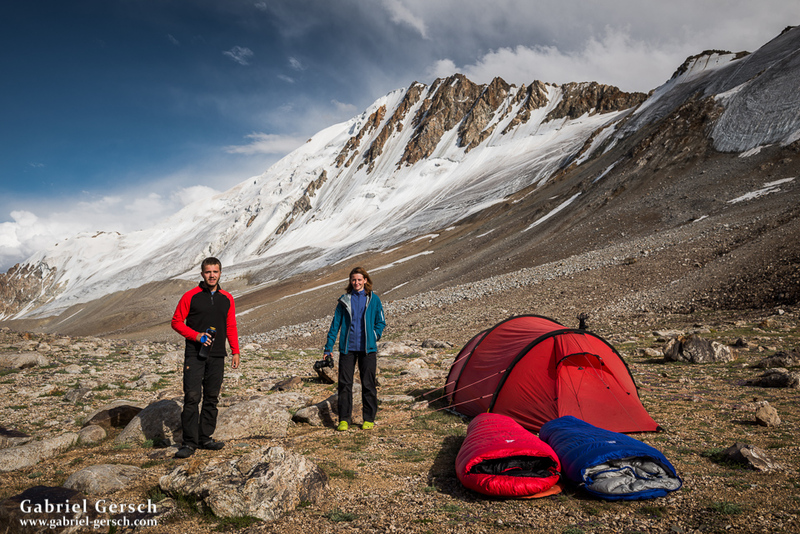 People are incredible friendly and show great hospitality. 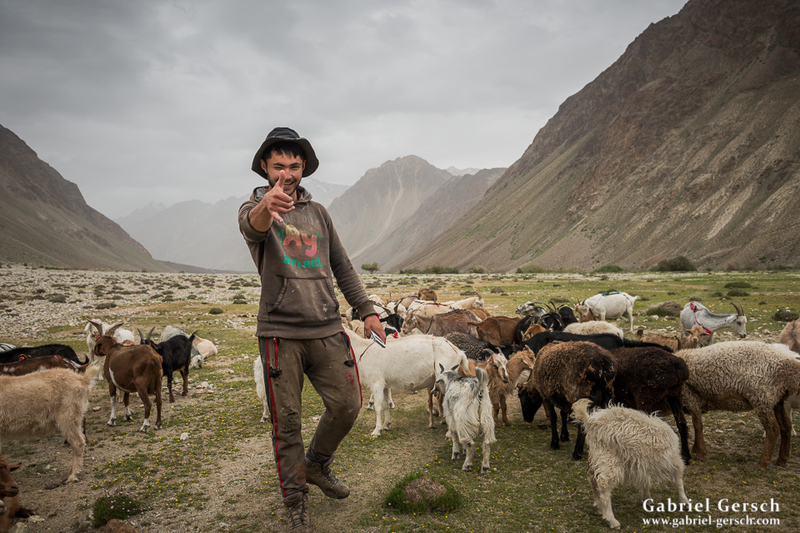 Compared to other places around the Pamir region they are more educated, speak better English and are always happy to see tourists. 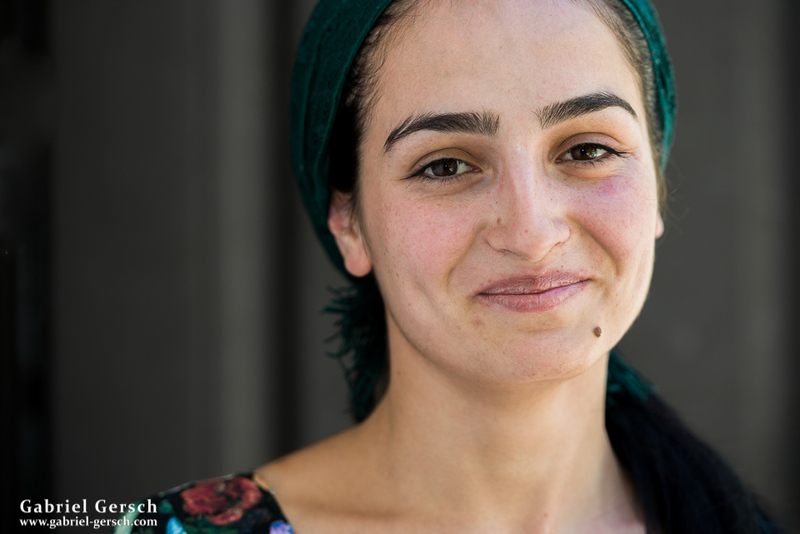 Most of them belong to the Ismaili community which believes in a broad-minded lifestyle, although many of them don’t take their religion too serious anyway. 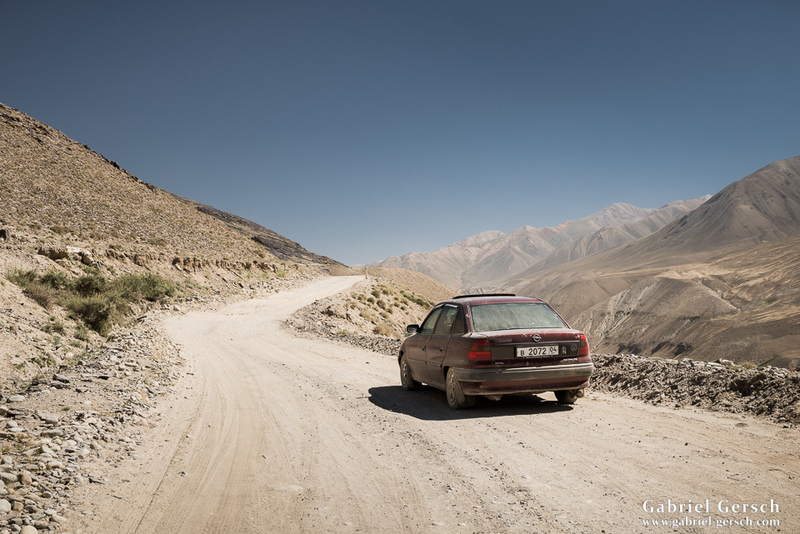 Also, the region is very poor. 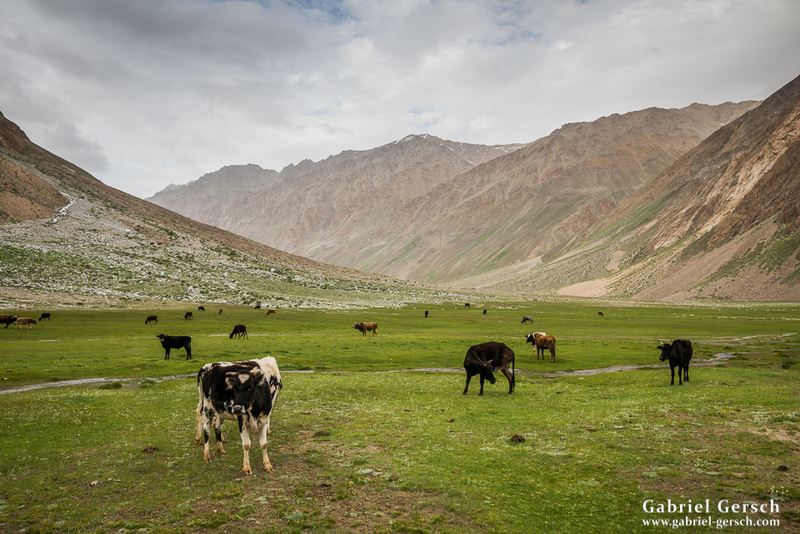 The climate is extreme, so opportunities for agriculture are limited. 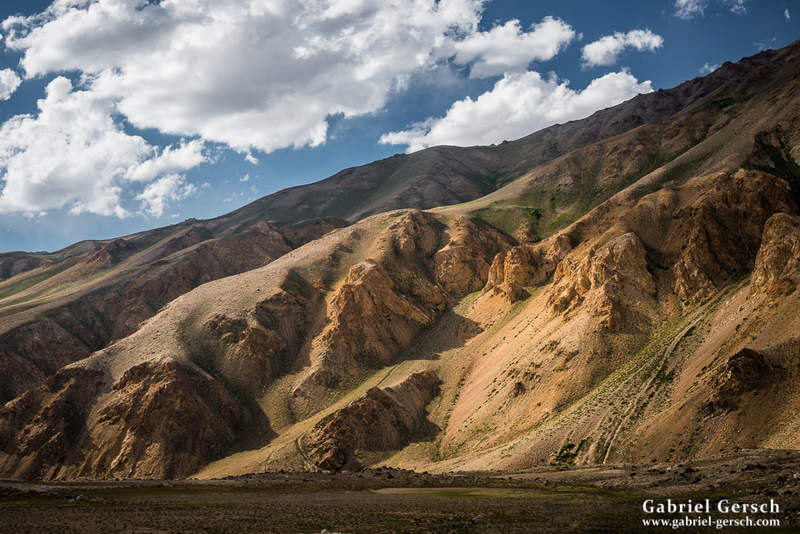 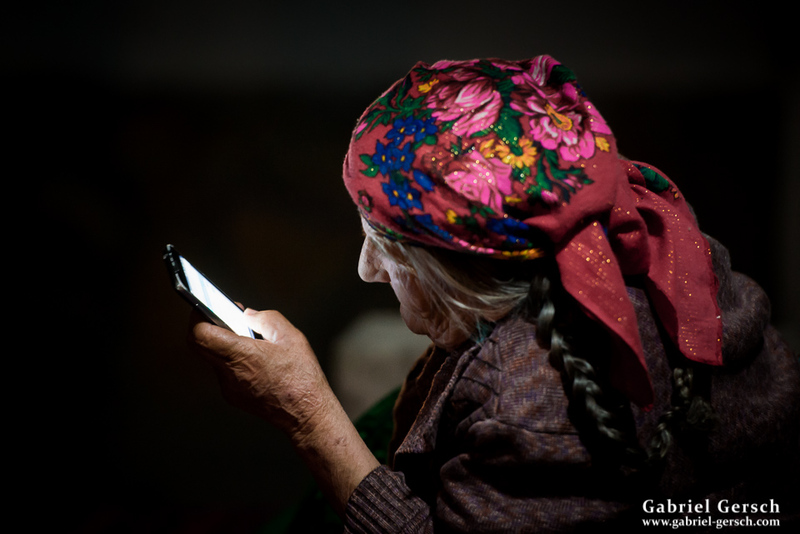 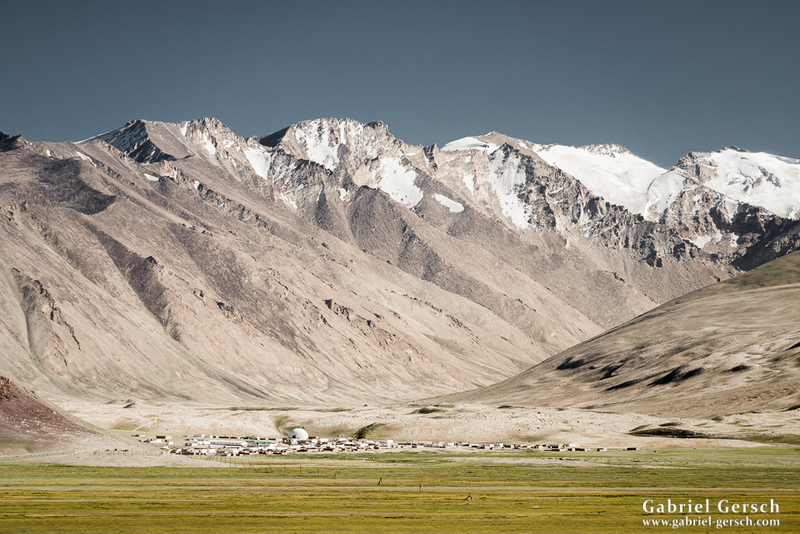 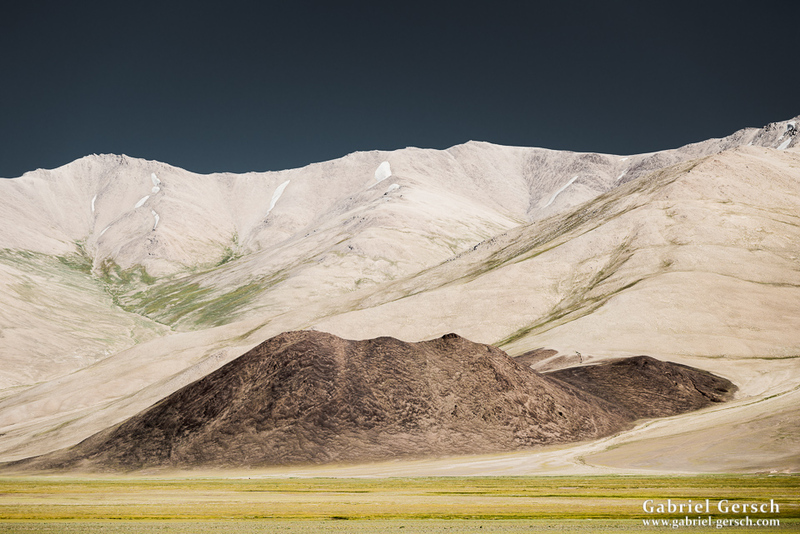 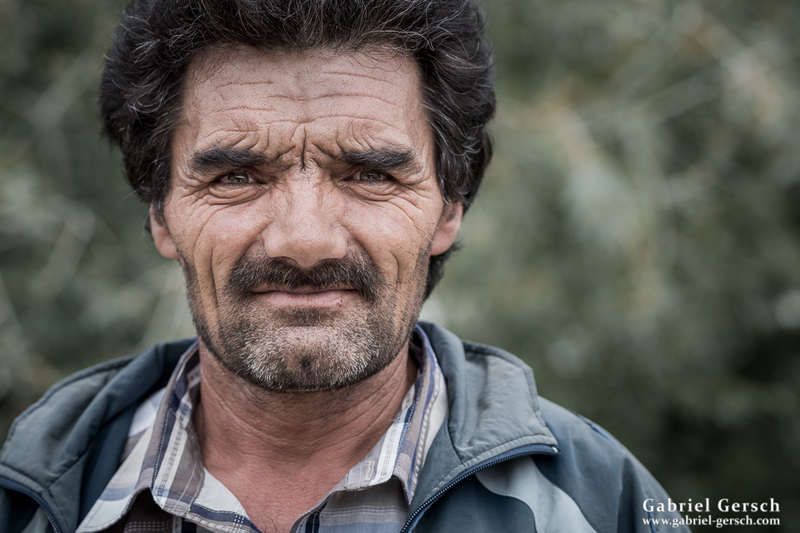 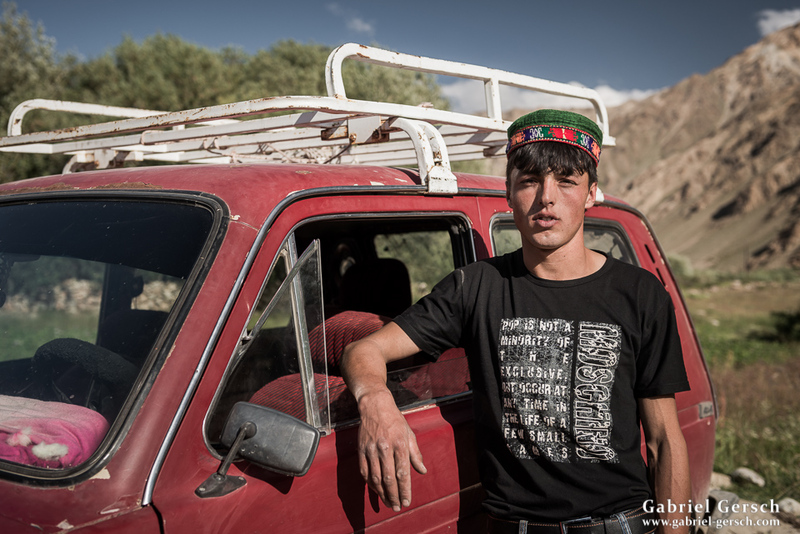 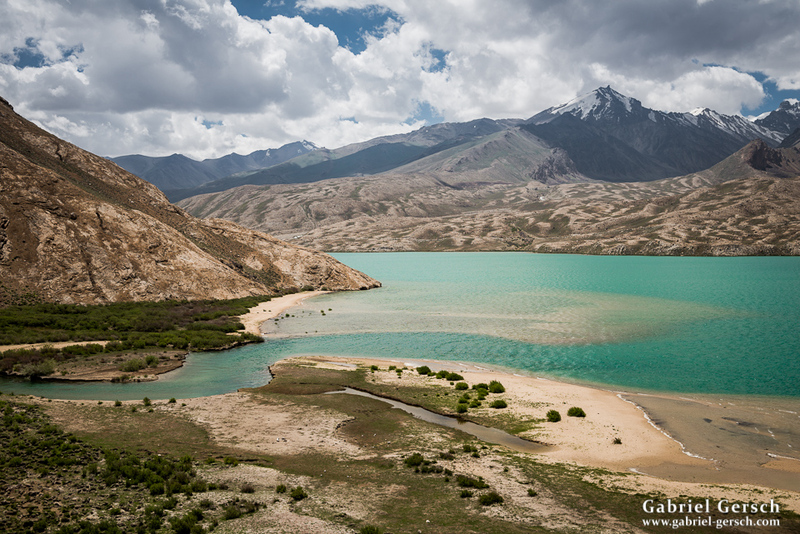 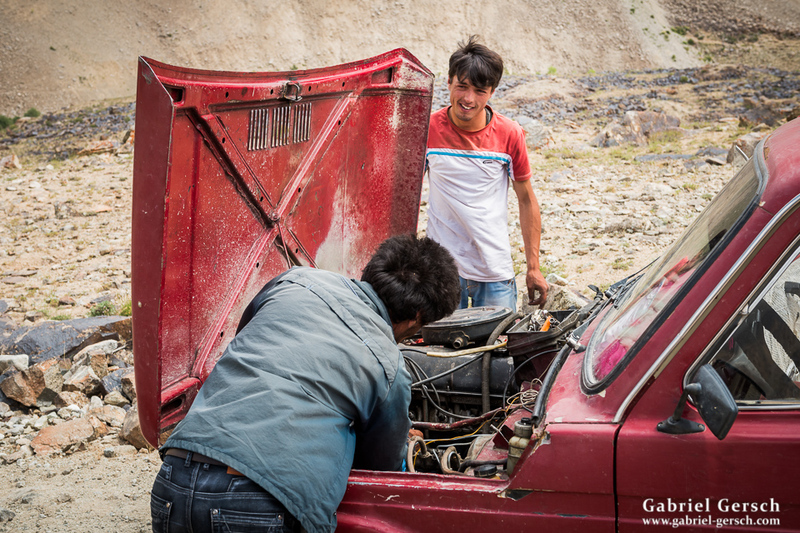 Pamir (GBAO) is an autonomous region within Tajikistan, still their standard of living is relatively low. 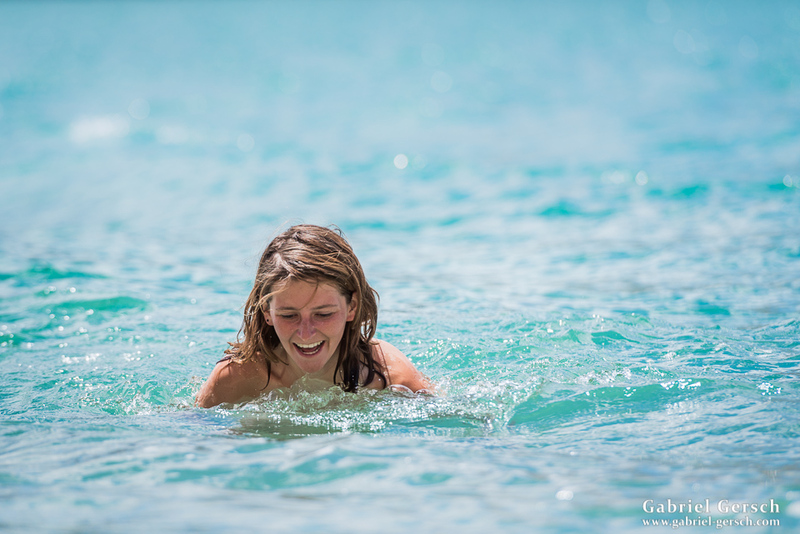 Tourism is something that could help improve the economic situation over there and I see a great potential for that. 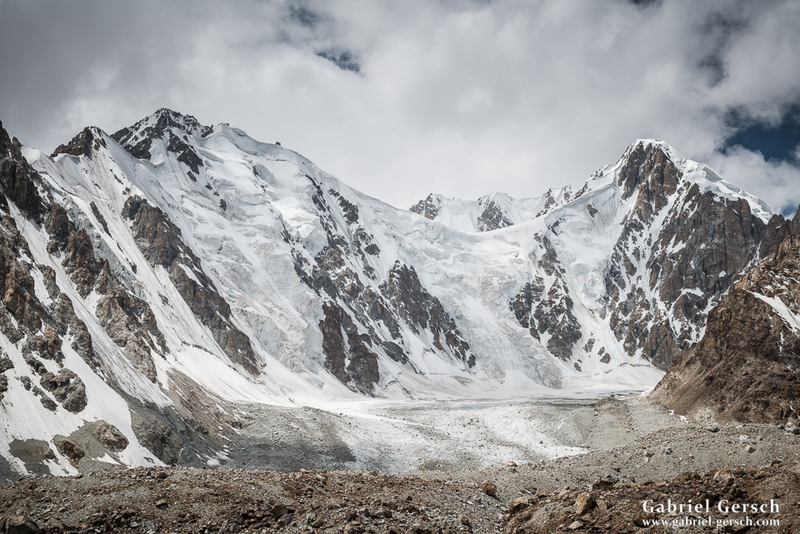 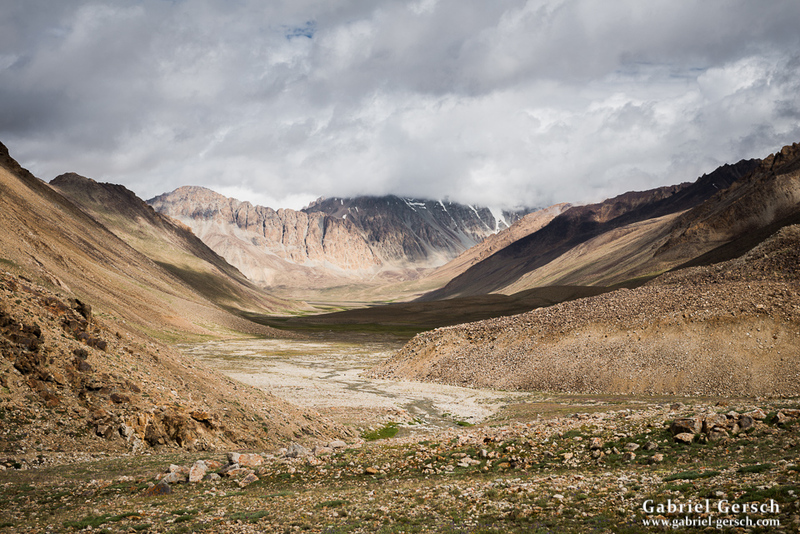 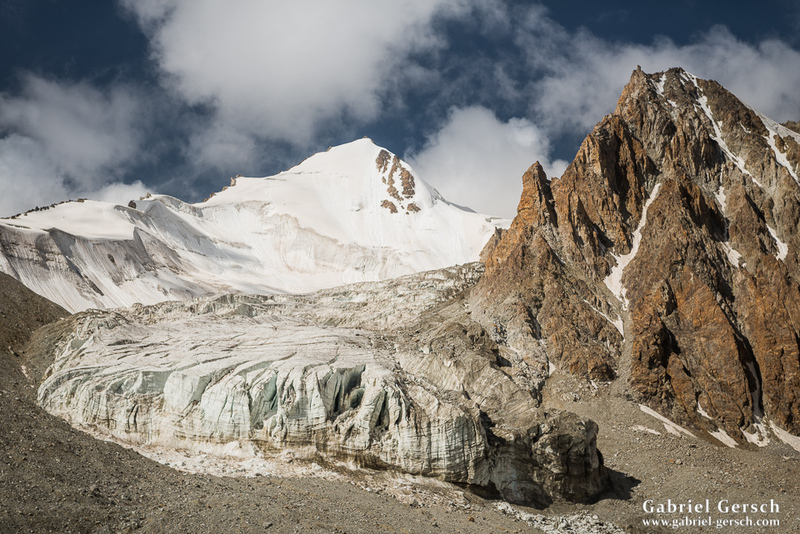 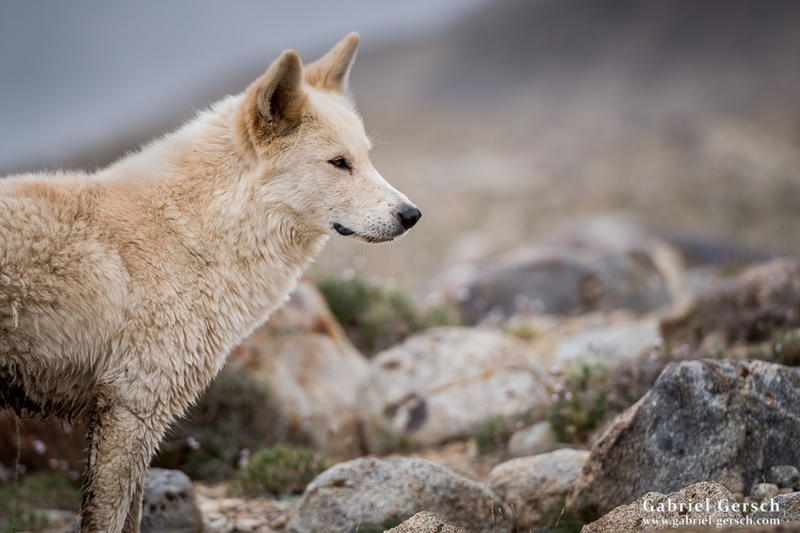 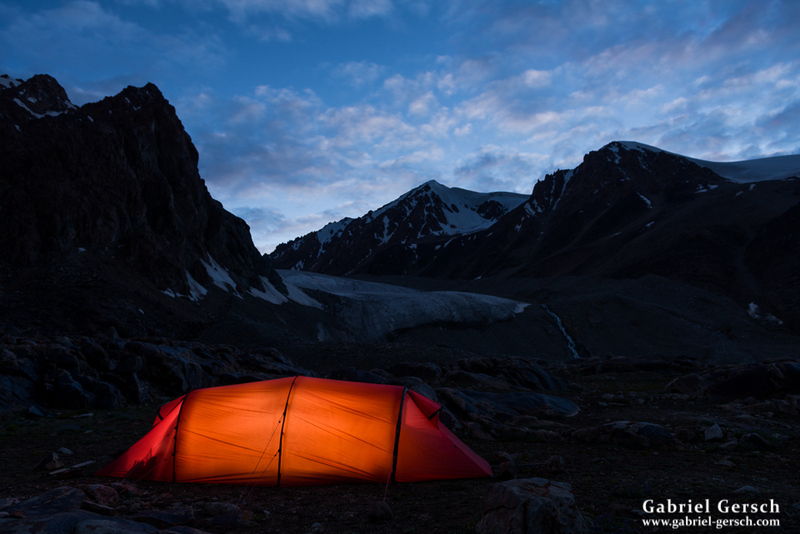 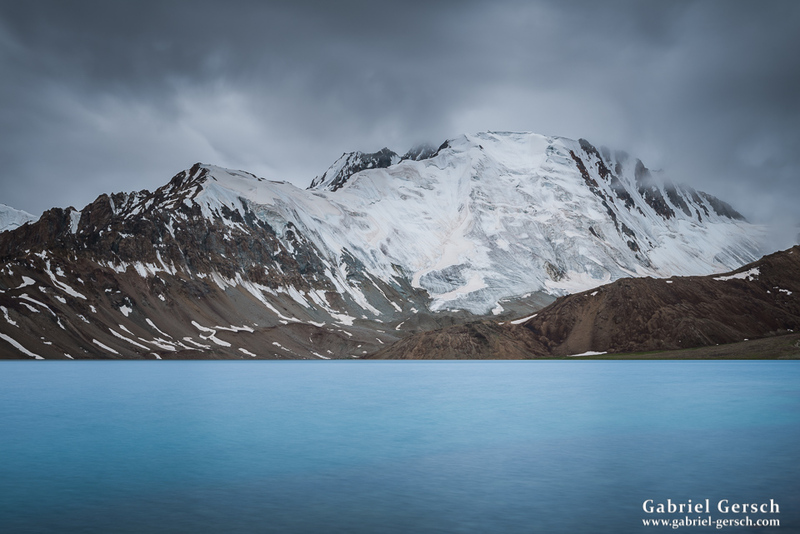 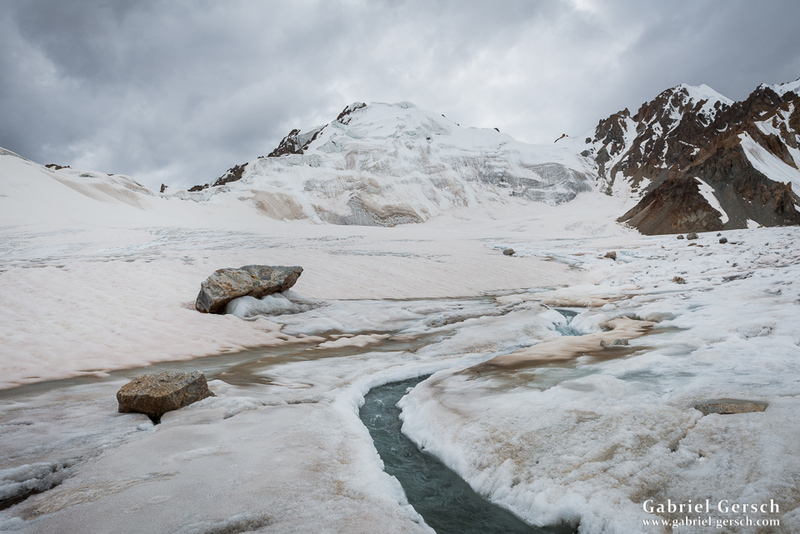 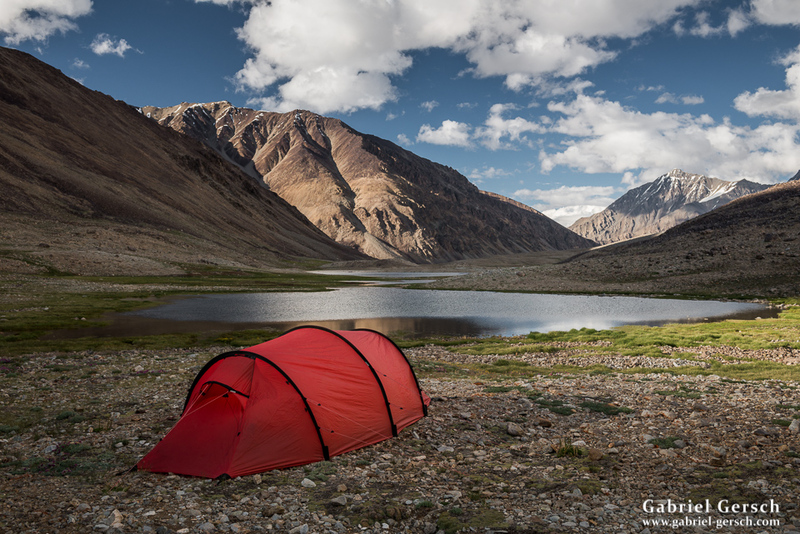 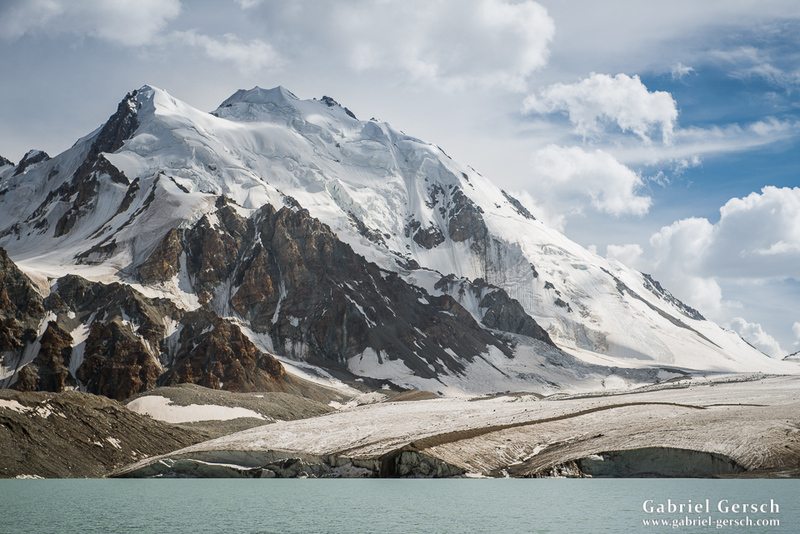 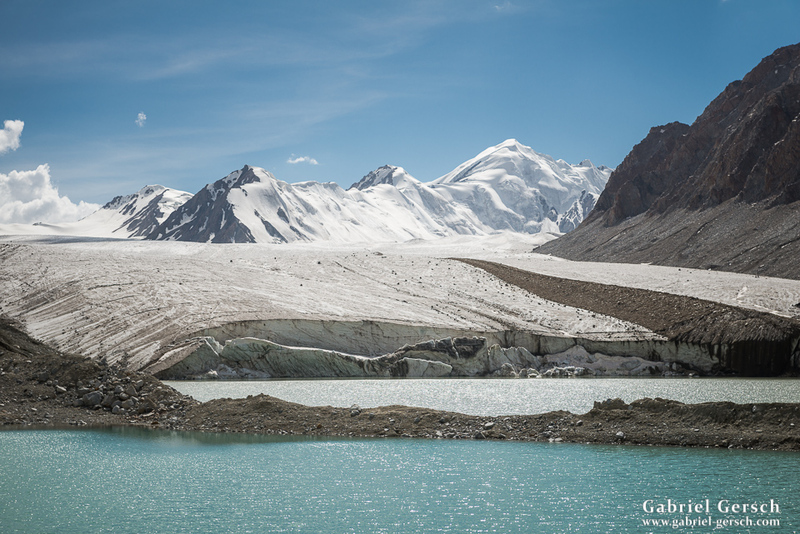 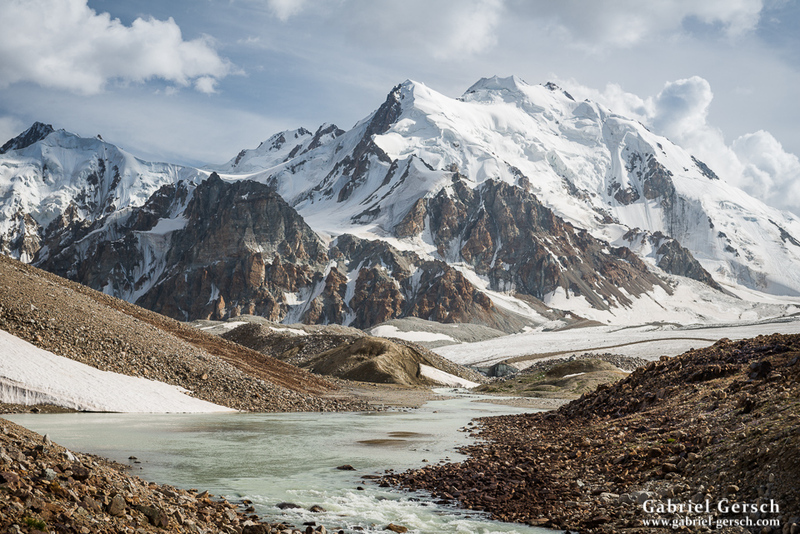 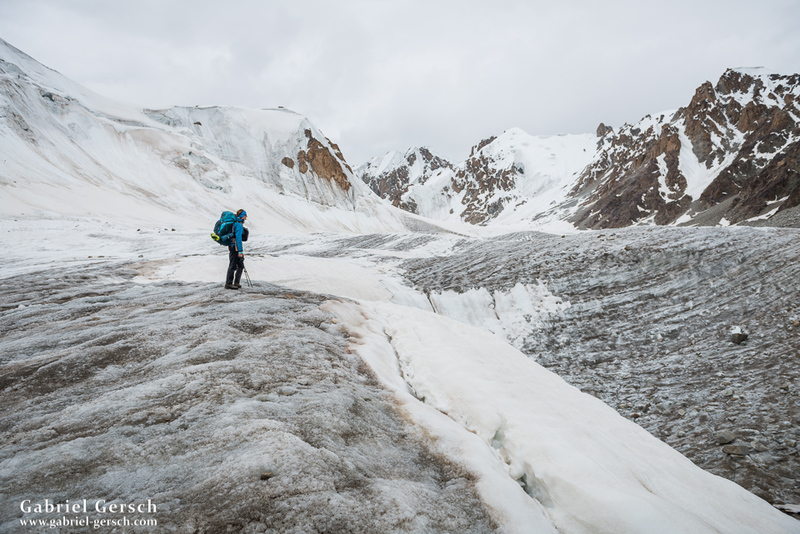 The place is safe, at least safe enough, and I wouldn’t be surprised if more and more adventurers around the world were to come and see the vast wilderness of the Pamir Mountains.